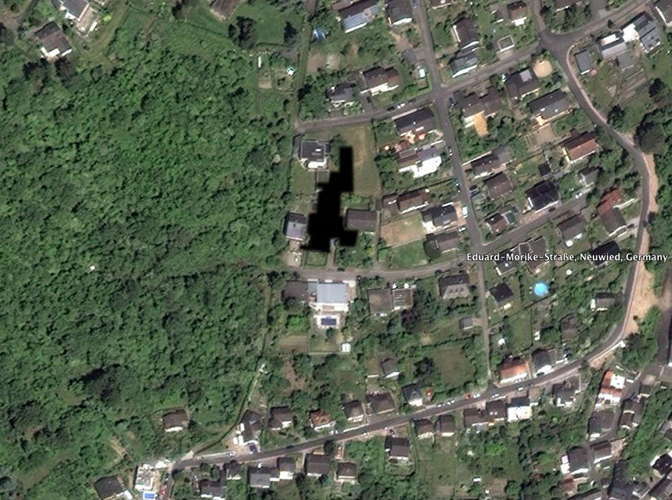 The open-air site of Gönnersdorf was discovered and partly destroyed in 1968, during the construction of a cellar for a private house in Feldkirchen-Gönnersdorf. After digging through the pumice, bones and slabs of stones appeared and it became clear that what one was dealing with was a location of the Late Glacial. A few days after the discovery, Dr. Gerhard Bosinski from the University of Cologne was put in charge of further investigations of the site. 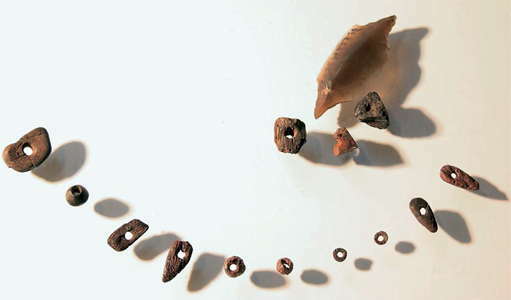 Two excavation campaigns were conducted the same year, excavating the part called Concentration I (CI). 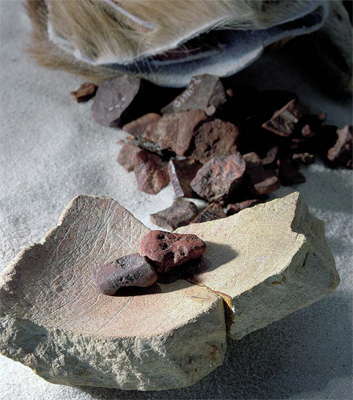 During these two campaigns what we today know from Gönnersdorf as the typical inventory was unearthed: the pulverised red hematite, a fireplace, features from habitation constructions, lithics, statuettes of ivory and antler, engraved slate plaquettes, jet beads, perforated animal teeth and a well preserved faunal record. 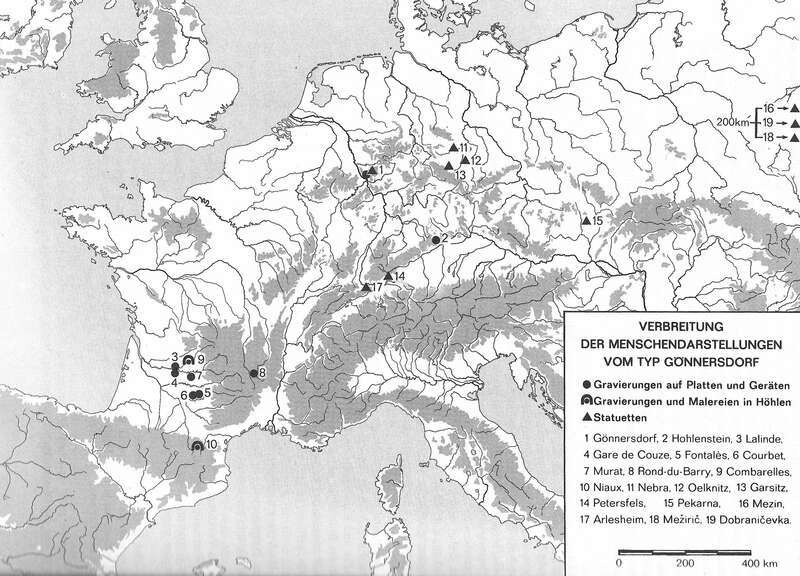 Based on these finds it was early evident that Gönnersdorf was a site of inter-regional importance. 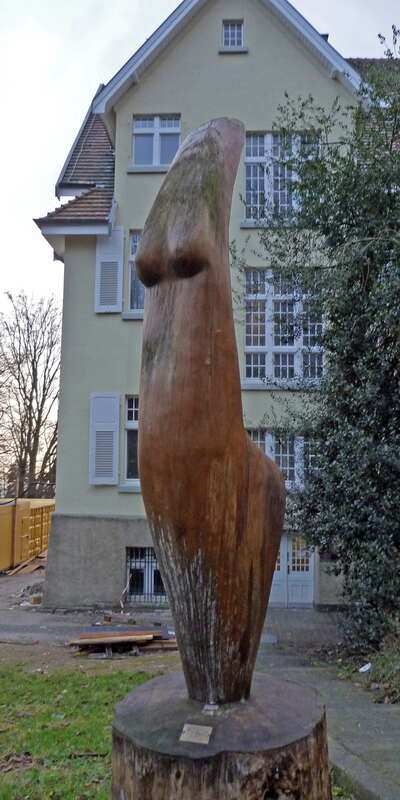 This is a beautifully done wooden sculpture of one of the most famous of the Gönnersdorf venus figures. It is rare to see such a well done modern recreation of an ancient sculpture. The figure is outside the Museum of Monrepos, Monrepos Archäologisches Forschungszentrum und Museum für menschliche Verhaltensevolution, at Neuwied, a town on the right bank of the Rhine, 12 km northwest of Koblenz. The museum was closed at the time of the photograph, but it is now reopened. 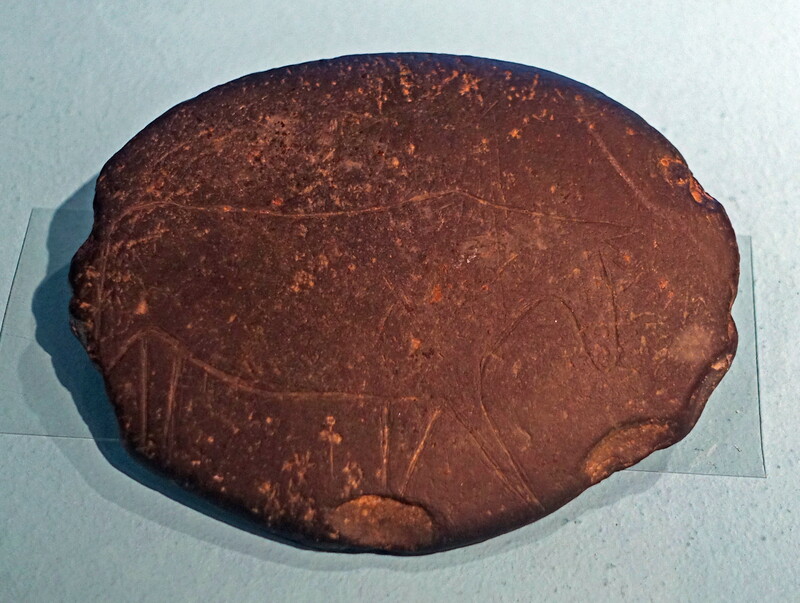 Drawing of a seal, found within a pit inside a house structure. 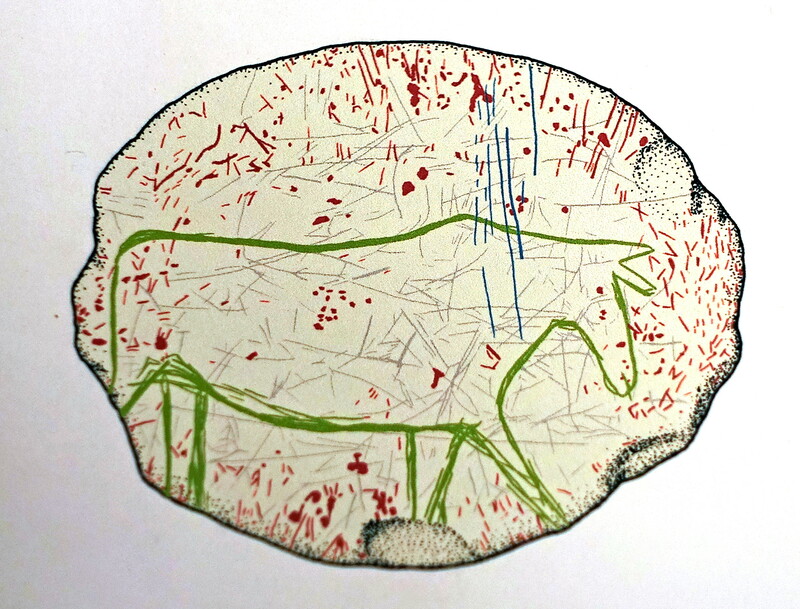 Size of the plaquette: 22 x 15 cm. 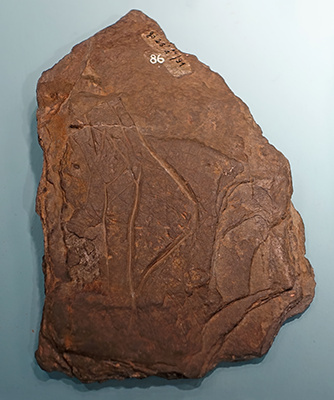 That at least some members of the Gönnersdorf Magdalenian group(s) travelled over very long distances during their lifetimes is suggested by well-observed engraved depictions of seals. 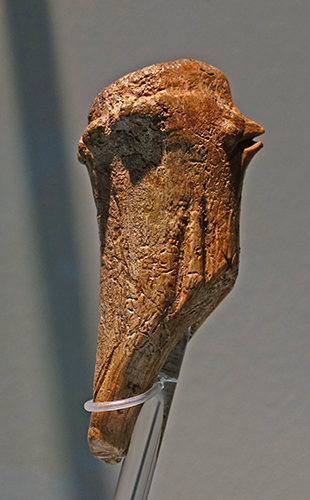 Although it has sometimes been suggested that the former species could have migrated up the Rhine as far as the Central Rhineland - at that time located much further away from the Late Glacial coastline - no bones of this animal are present at any site and it is more probable that the animals were observed by the artists at the coast on other occasions. Neuwied is part of Gönnersdorf, and a new pit in Eduard-Mörike-Straße in that area has shown the existence of a permanent settlement of 30 to 60 nomadic hunters, fifty metres above the Rhine river near a small brook in a hollow, with a favourable microclimate, having a south facing slope on the northern edge of the Neuwied basin. 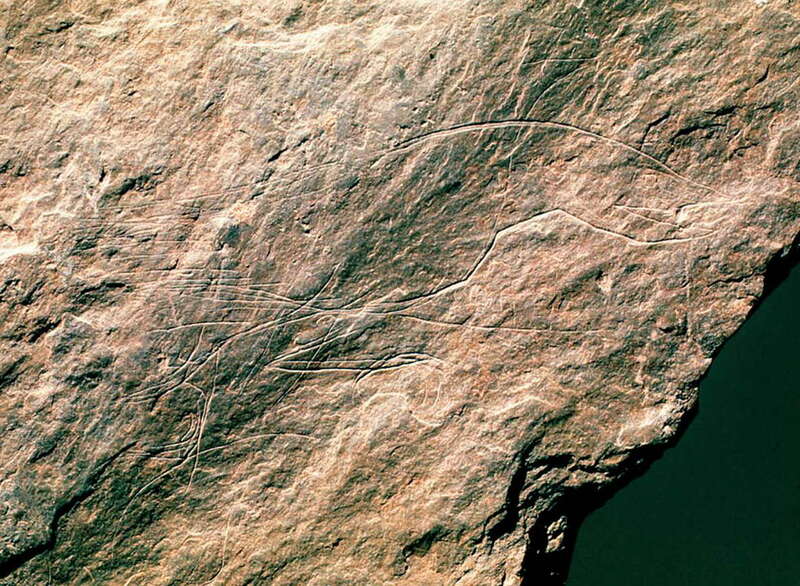 It has been shown to be from 12 500 BP, a thousand years before the last eruption of the Laacher See volcanic eruption. This eruption sealed the area under a layer of volcanic ash, which protected it from most damage. 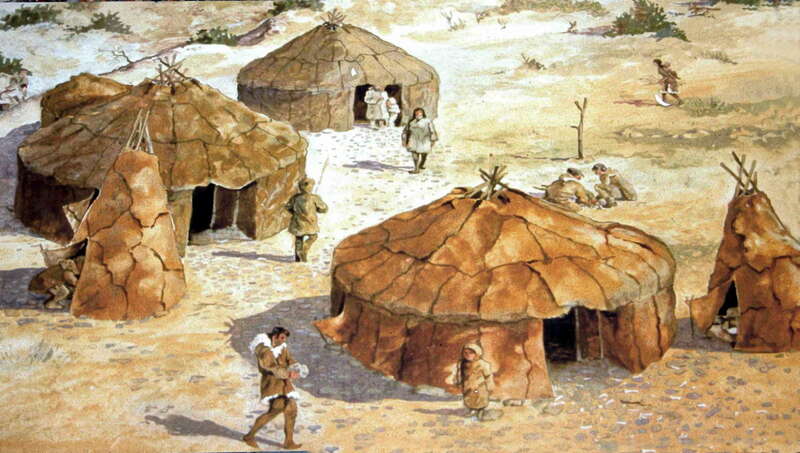 Image of the Magdalenian settlement in Gönnersdorf, 12 500 BP, RGZM special exhibition in Mainz 1975. Traces of two small round tents, and three large, fur-covered dwellings, with a broad oval shape, similar to a yurt, were revealed with a diameter of 6 to 10 metres. 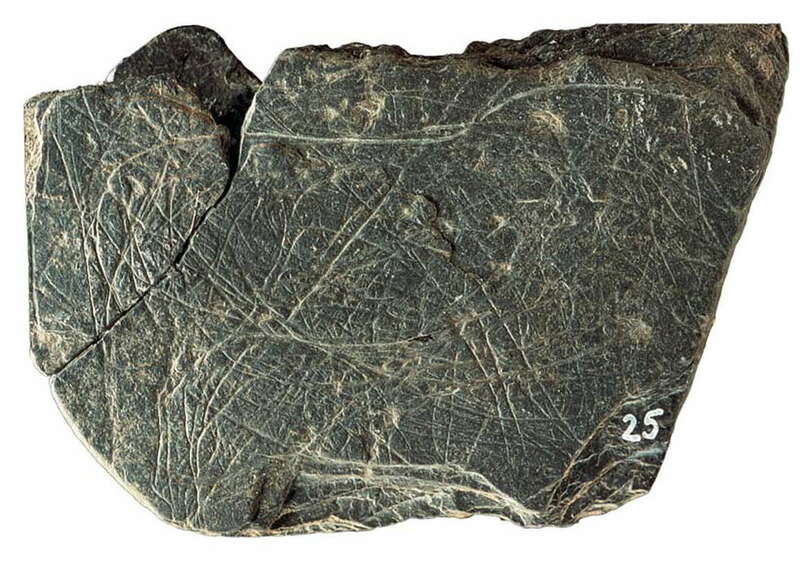 They were coloured red on the inside and outside, and the floors were paved with slate. 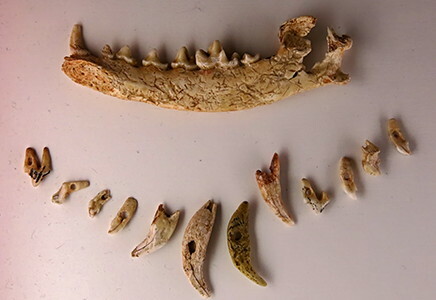 The settlement was systematically excavated over an area of 650 square metres, and bones were found of mammoth, horse, bison, aurochs, reindeer, deer and arctic fox, as well as birds. 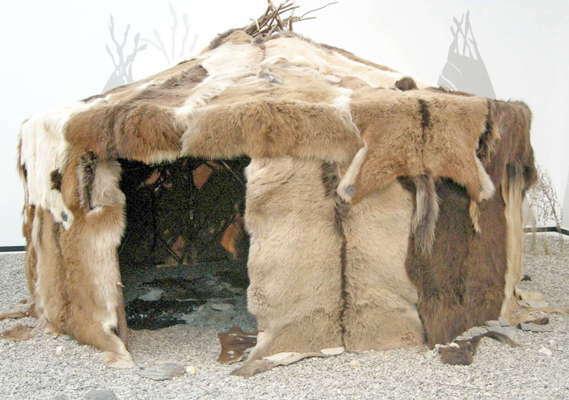 A reconstruction of a typical fur covered hut of the time. Notice the lattice work of the sticks used to give strength to the support of the walls of the structure, visible in the larger photo if you click on this one. Another version of the Gönnersdorf hut, recreated at the Museum of Malgré-Tout in Treignes, Belgium. The menu of the ice hunters was diverse. 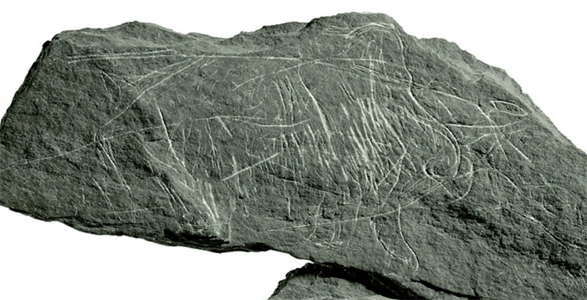 Besides small and medium-sized animals, they also ate plants. The Ice Age hunters used many foods that we would not now eat. 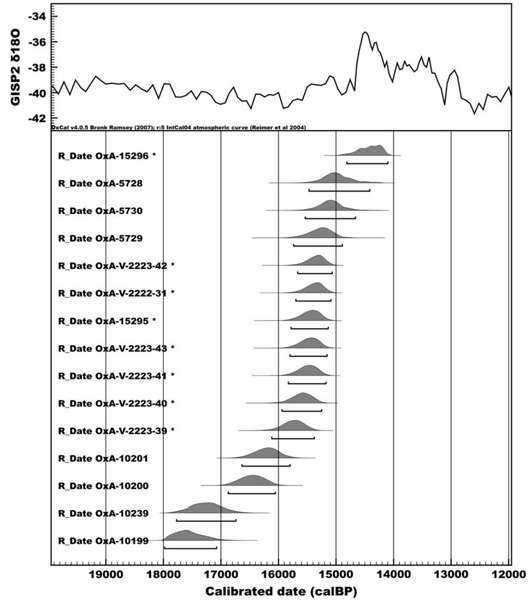 The climate of the last ice age was subject to strong fluctuations. Besides times when it was very cold, there were also phases when it was almost as warm as today. The people of Oberkassel lived in such a warm time. 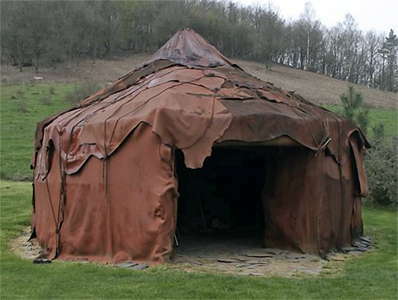 The people of Gönnersdorf lived during a cold phase, and built tents like this one in order to live comfortably in the glacial conditions. 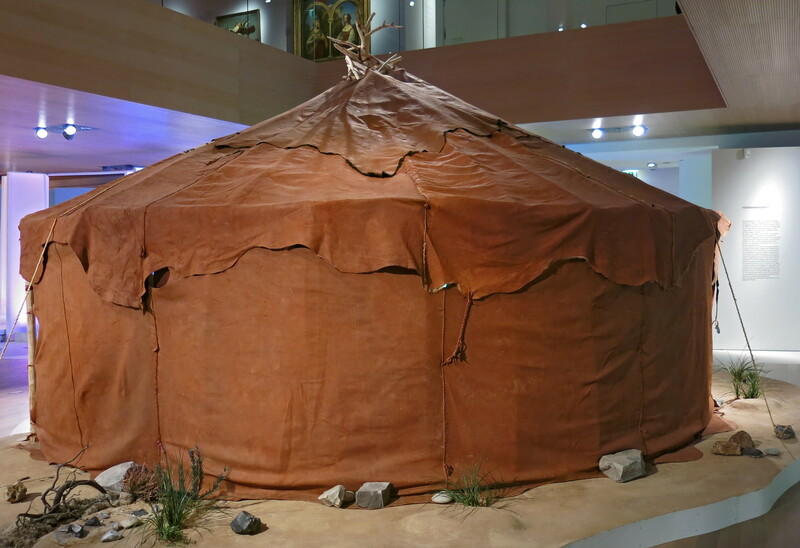 The design of the Gönnersdorf tent meant that it was a comfortable place to live. 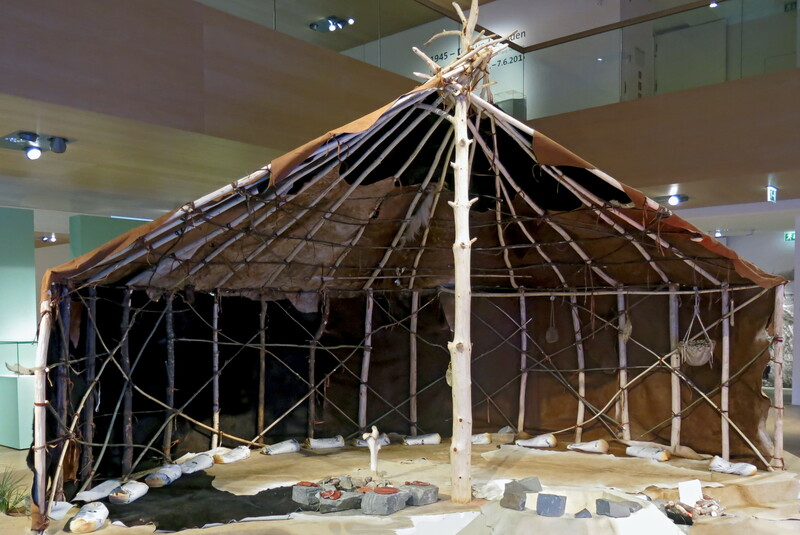 The fireplace was set up just to one side of the strong central pole which allowed smoke to escape easily through the small central opening at the top of the tent, stones were heated in it for overnight warmth while the inhabitants were sleeping, there was a large open and covered space for communal living, secure from snow and ice and wind, and the construction allowed many household items to be hung from the roof beams, out of the way, but available at a moment's notice. The Gönnersdorf tent from another perspective. Between the Eem and the Holocene lies the last cold period, which is here referred to as the Vistula. 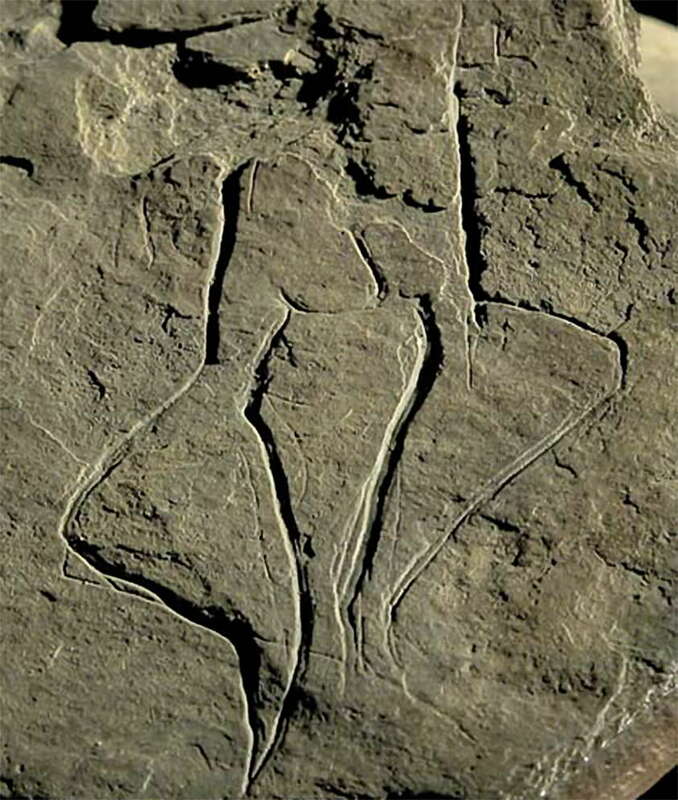 It reached its peak some 24 500 years ago. Between the glaciated areas, which extended from Schleswig-Holstein in the north, to the south to the foothills of the Alps, a life threatening dry and cold frost regime expanded. About 19 000 years ago a climatically milder period began, which ultimately led to resettlement of the area by humans. 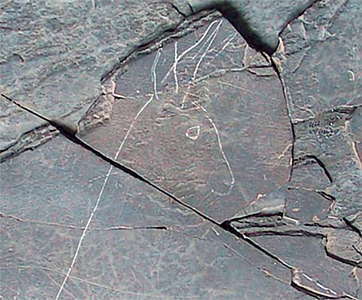 From 14 650 years BP, the climate changed drastically, the temperatures gradually increased to almost the present level. At first it was still drier in Central Europe, with wide, open grasslands, but soon the rainfall was enough to support a closed forest. Map of Europe showing the areas where Gönnersdorf/Lalinde figures have been found. 1 Gönnersdorf, 2 Hohlenstein, 3 Lalinde, 4 Gare de Couze, 5 Fontalès, 6 Courbet, 7 Murat, 8 Rond-du-Barry, 9 Combarelles, 10 Niaux, 11 Nebra, 12 Oelknitz, 13 Garsitz, 14 Petersfels, 15 Pekarna, 16 Mezin, 17 Arlesheim, 18 Mezhirich, 19 Dobranicevka. 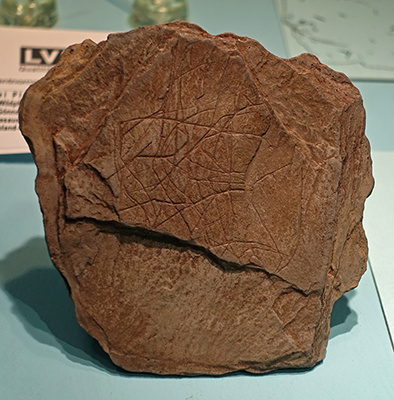 The Neuwied Basin with the Laacher See and markings of important Palaeolithic sites. The Magdalenian horizon at Gönnersdorf is located between two volcanic layers, the Eltville Tuff horizon that was deposited during the Würmian Pleniglacial, about 20 000 years BP, and the Laacher See Tuff that was deposited during the middle of the Allerød interstadial, about 10 900 cal BC17. 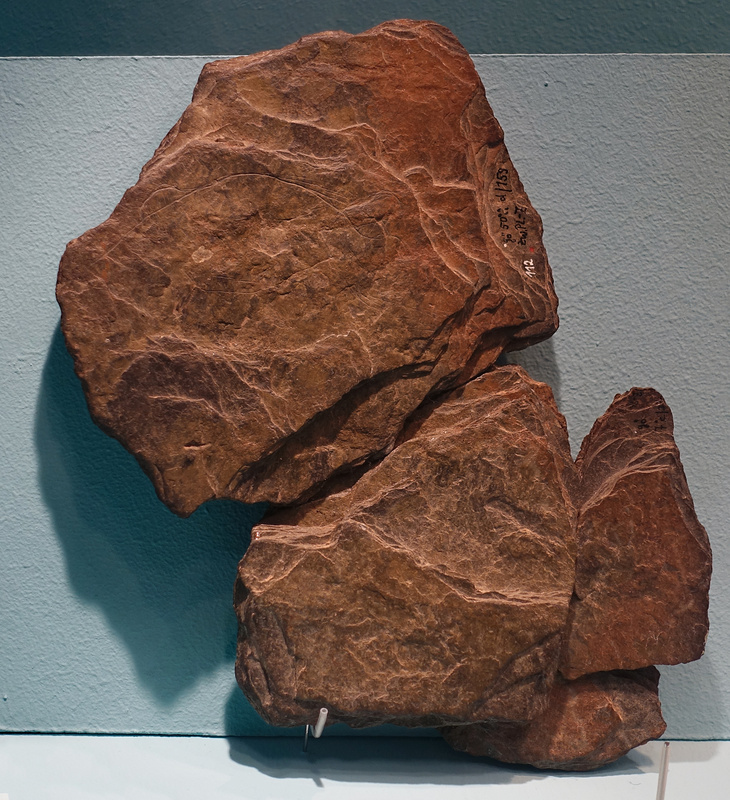 Above the Eltville Tuff horizon, the loess deposition was interrupted by the formation of a weakly developed soil (Soil III of the Würmian loess complex) of para-rendzia type, and below the Laacher See Tuff was another soil of a para-rendzia type that was formed during the early Allerød times. This slate shows an engraving of a horse, as well as two typical engraved Gönnersdorf venus figures. 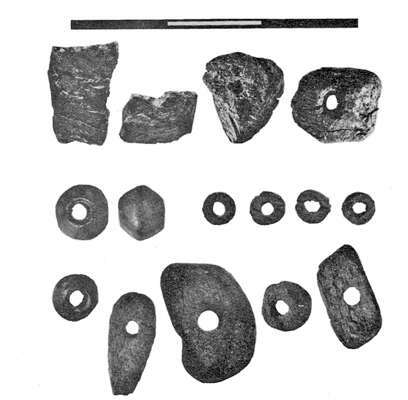 Tools such as knives, drills, scrapers, and burins were found, as well as ivory and bone needles and arrowheads, jewellery such as necklaces and trimmings for clothing such as deer canine teeth, often used as hunting trophies, snail shells, beads made of petrified wood or jet, and small female figures made of antler and ivory. 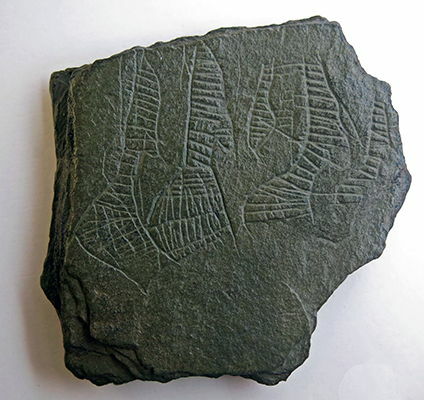 Engraved slate, the largest contribution of knowledge about late ice age art, has given us more than a thousand slate tiles so far discovered with incised drawings. 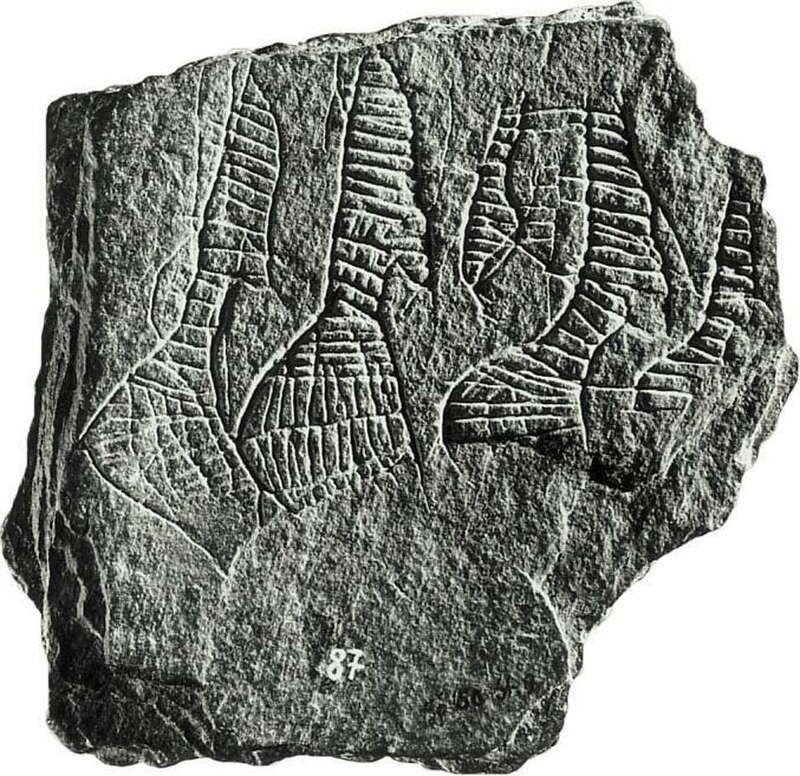 The engravings show, in the main, either game animals or female figures in profile, some perhaps even dancing. 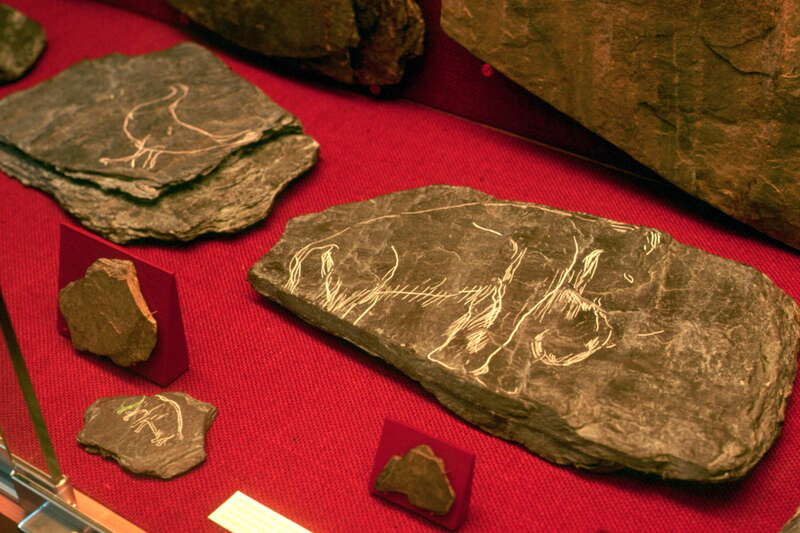 Slates with an engravings of mammoths and a bird from the Magdalenian settlement in the Neuwied Basin of Gönnersdorf. 12 500 BP, RGZM special exhibition in Mainz 1975. The site of Gönnersdorf is situated at the right bank of the Rhine, at the north-western exit of the Neuwied Basin, about 15 km northwest of the city of Koblenz and immediately east of the Andernacher Pforte (Andernach Gate) (fig 6). 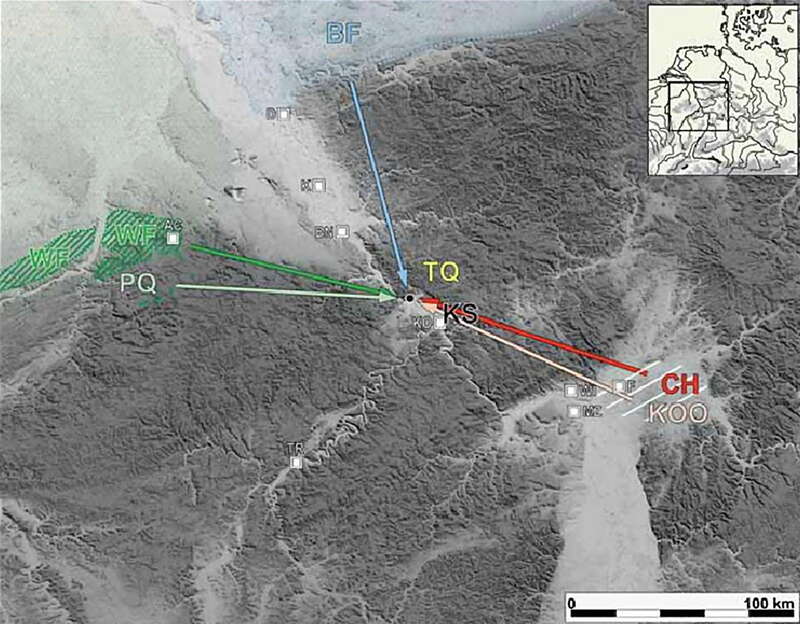 The site was found on a spur, of a triangular piece of land, which is 3 km long and 1 km wide. Directly west of the settlement, was a small stream running through a narrow, steep valley and draining into the Rhine. The valley both protected the people from the worst of the weather, and supplied them with the slate that was used for pavement in the settlement area Towards the northwest, the site was protected by the slope of the high terrace, and was easily accessible only from the east. The settlement is strategically placed, oriented towards south and is exposed to the full trajectory of the sun and has an excellent view over the Neuwied Basin. 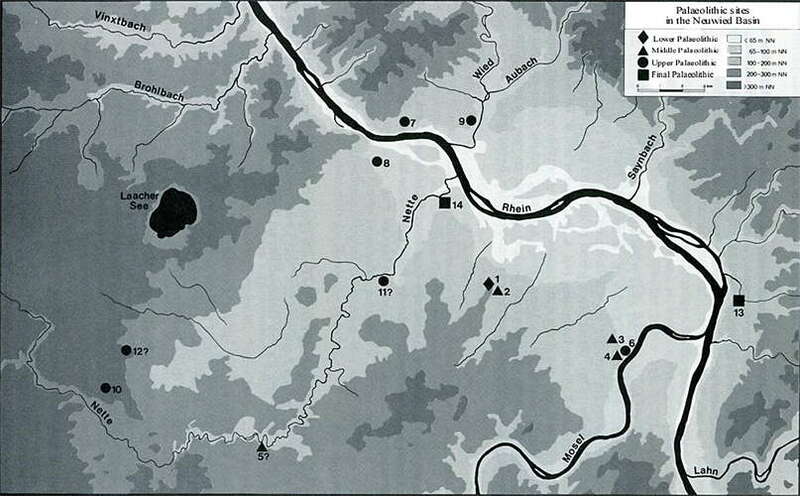 The settlement structures were buried by pumice after the last large eruption from the Laacher See Volcano (fig 7), located 11 km west of Gönnersdorf, at the middle of the Allerød interstadial, about 10 900 cal BC 16. 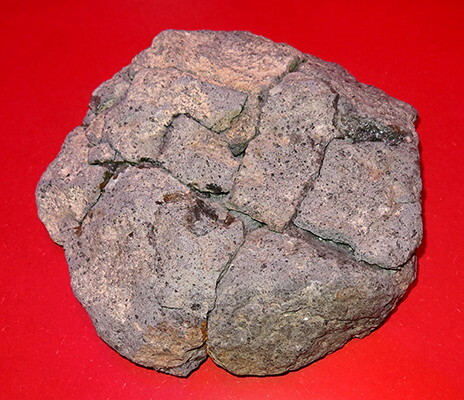 Due to this thick cover of pumice, the remains at the site are well preserved. Although the settlement remains were protected by the cover of pumice, the material has still been affected by different processes such as freezing and thawing action and movement caused by burrowing animals. These processes have caused some of the artefacts to be moved vertically, and may also be the cause of the breakage of many of the slate plaquettes. Because the site is placed on a middle terrace, with both down slope movements and sliding through solifluctuations from the high terrace we must also assume that material have both been moved away from the site, as well as been added to it. 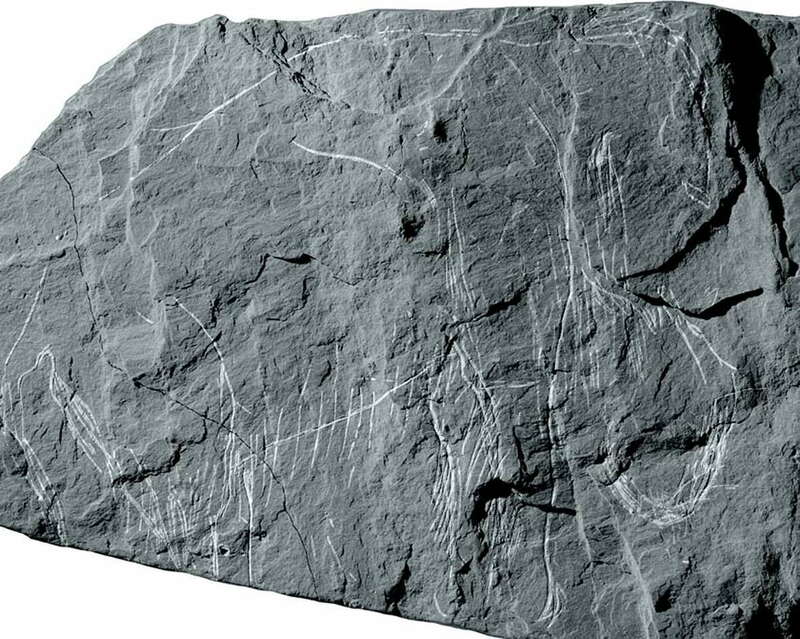 We should also keep in mind the time length existing between the times the site was settled until it was sealed by the pumice. 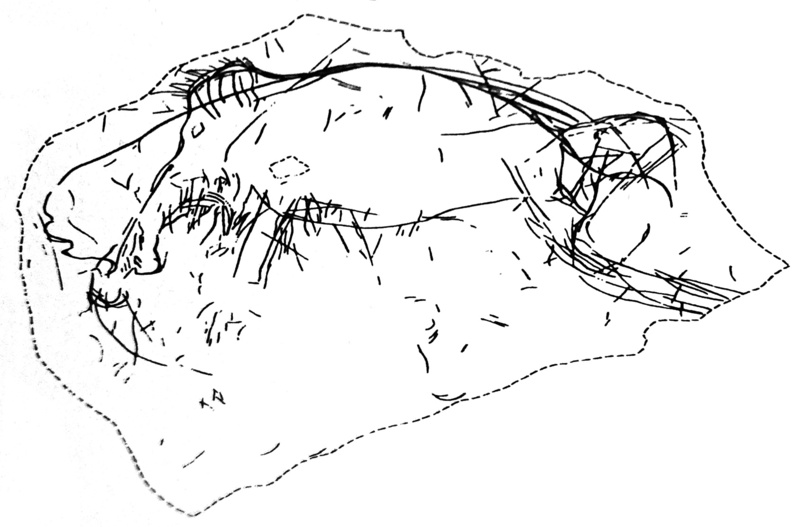 Topography of the Neuwied Basin. 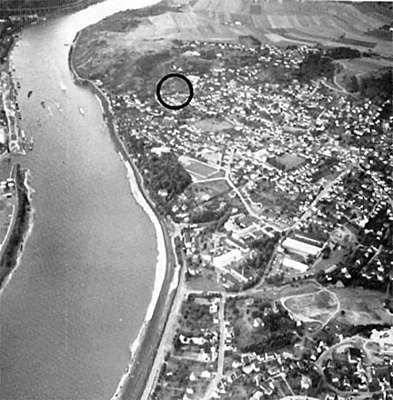 The site Gönnersdorf is marked by circle. In the upper right corner, the remains of the Andernach Gate, the Andernacher Pforte. 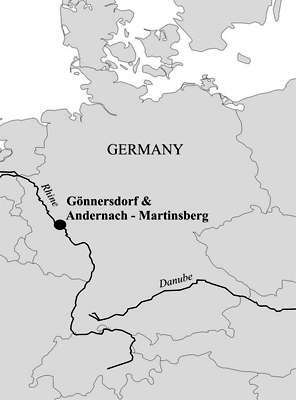 The gate of Andernach is, or was, a bottleneck in the Rhine valley below Andernach. The late glacial open-air sites of Gönnersdorf and Andernach-Martinsberg in the German Central Rhineland are well known for their Magdalenian occupation and activities. 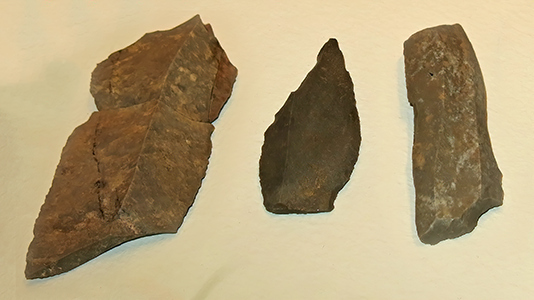 The latter site also produced evidence for a younger, Final Palaeolithic occupation of the locality by people of the Federmessergruppen. Both sites are particularly well preserved, largely due to their burial beneath volcanic deposits of the late glacial Laacher See eruption. The Andernach-Martinsberg site and excavations were rediscovered in the early 1980s. Probability distribution of calibrated radiocarbon dates from Gönnersdorf plotted against the oxygen isotope record from the GISP2 Greenland ice core. * denotes AMS dates conducted for this study. Venus figurine in bone from Gönnersdorf. 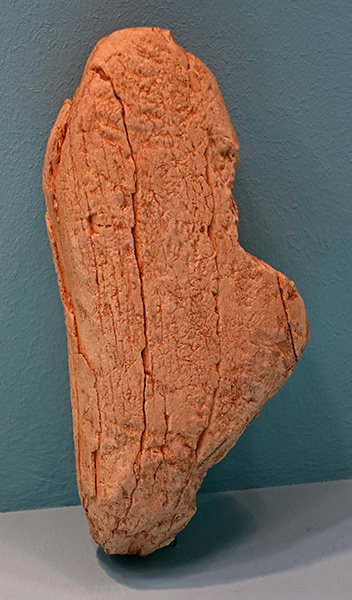 Statuette shown in the colour photograph above. 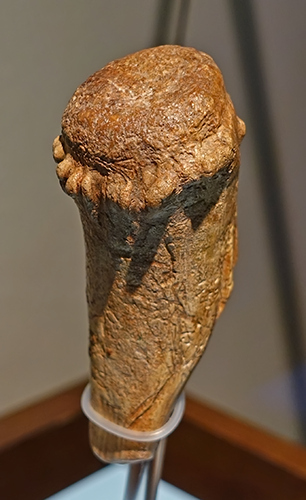 On the rod-shaped upper body are two breasts. Height 71 mm, breadth 160mm. 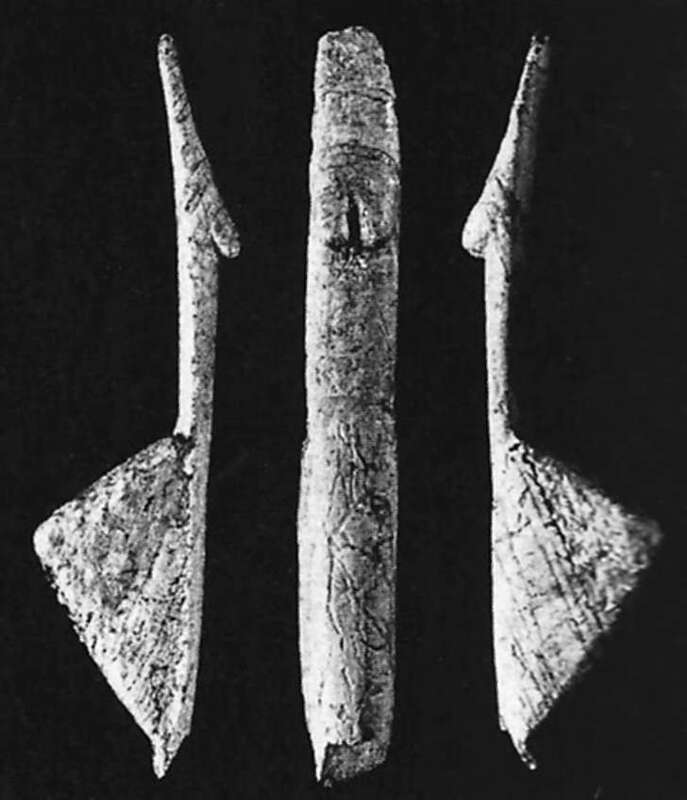 Venus figurine in antler from Gönnersdorf. Lender: Directorate General for Cultural Heritage Rhineland-Palatinate, Generaldirektion Kulturelles Erbe Rheinland-Pfalz. 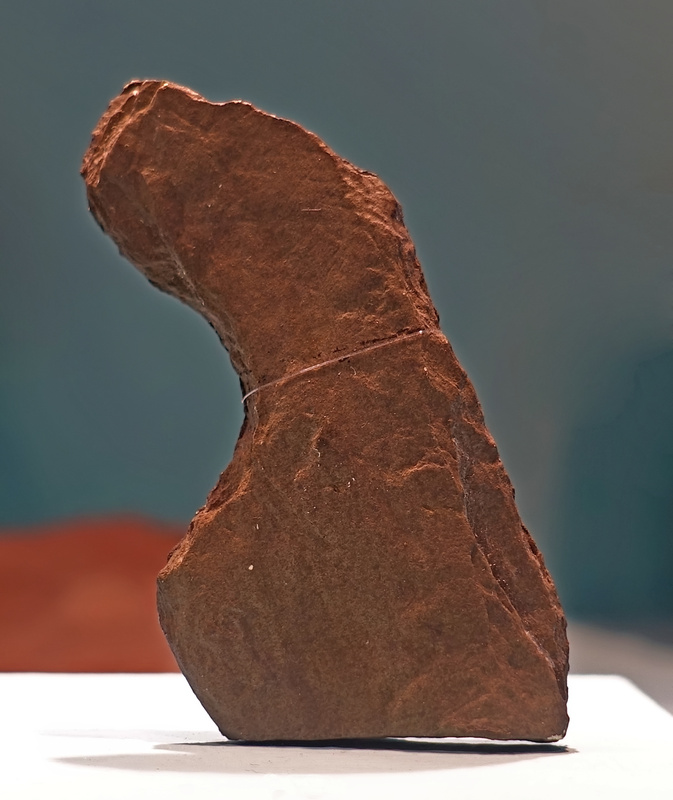 Statuette displayed in the colour photograph above. Venus figurine made from the tip of an antler, from Gönnersdorf. 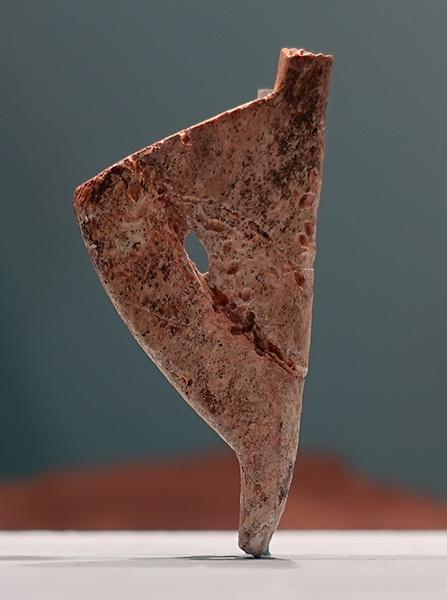 Statuette produced from the tip of an antler, shown in the colour photograph above. The antler is almost untouched in the upper part. Height 87 mm, width 15 mm. 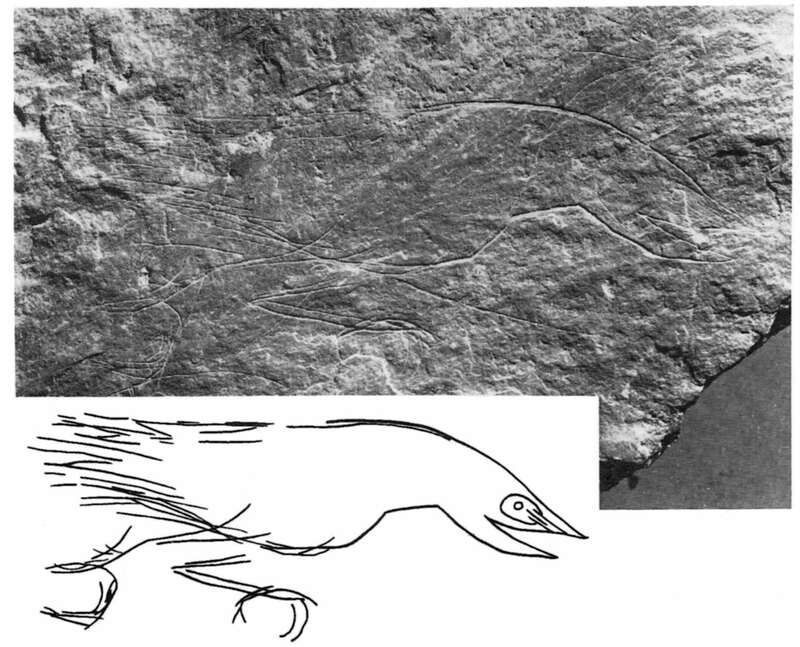 The diagram from Bosinski et al. 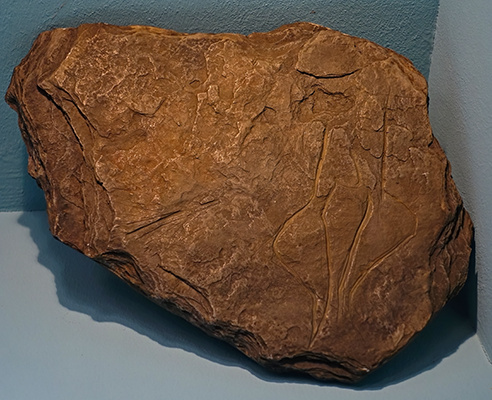 (1974) shows the outline of the original antler from which the venus figure was carved, and the outline of the resulting figurine. 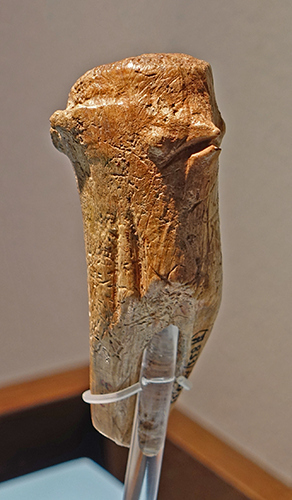 Venus figurine, incomplete, in bone/antler, Gönnersdorf, Stadt Neuwied. Length 47 mm, breadth 24 mm. Ivory Lalinde - Gönnersdorf figures from Andernach, Germany. Left: length 44 mm, breadth 10 mm. 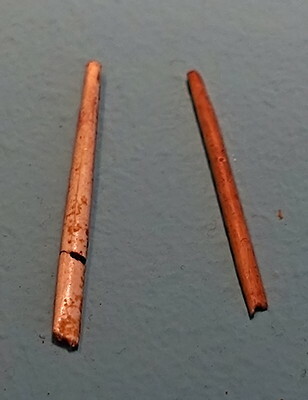 Right: length 47 mm, breadth 24 mm. Shown in the colour photograph above. 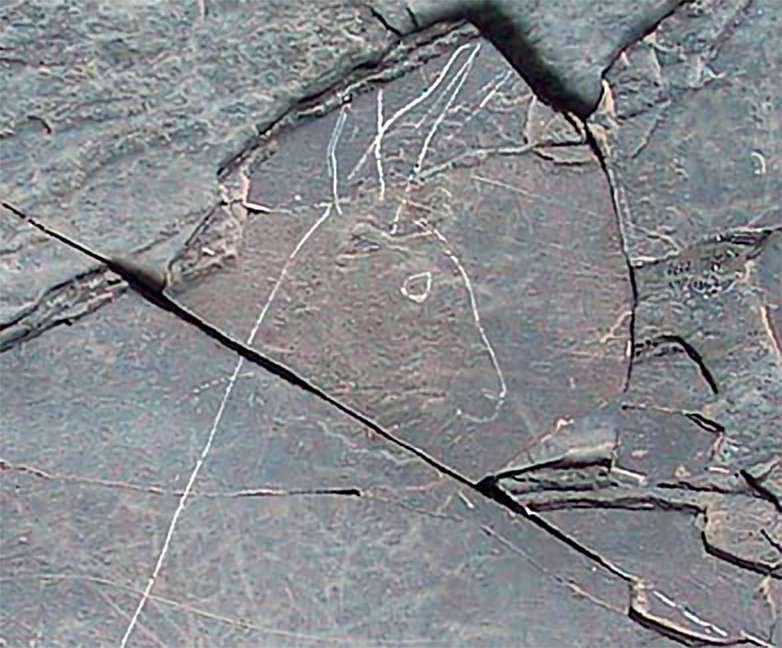 Venus figurine, in slate, Gönnersdorf, Stadt Neuwied. 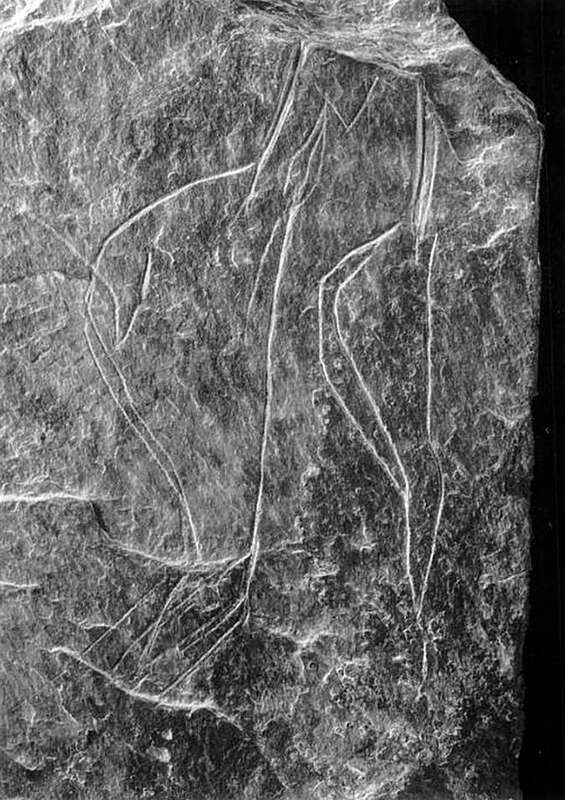 Venus figures shaped from the local stone, the centre figure is the same as the figure in the photo above, rotated through 180°. Venus figurine, Gönnersdorf, Stadt Neuwied. 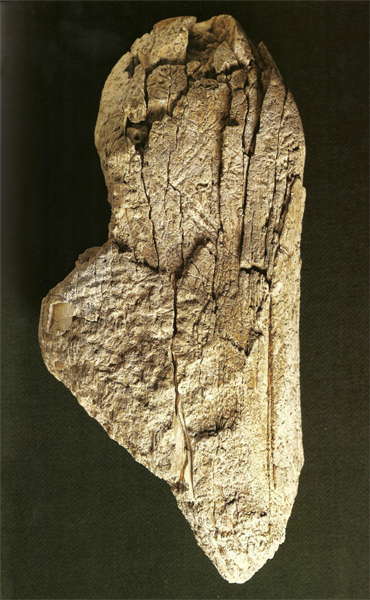 Female figure in ivory, Andernach, Kreis Mayen-Koblenz. This venus is from the Magdalenian, 15 000 BP, and shows a female figure in a very stylised form. 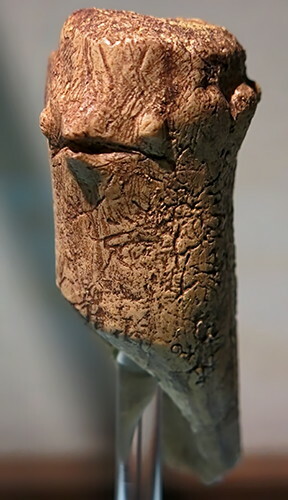 Ivory Lalinde - Gönnersdorf figure from Andernach, Germany. Length 200 mm, breadth 94 mm. 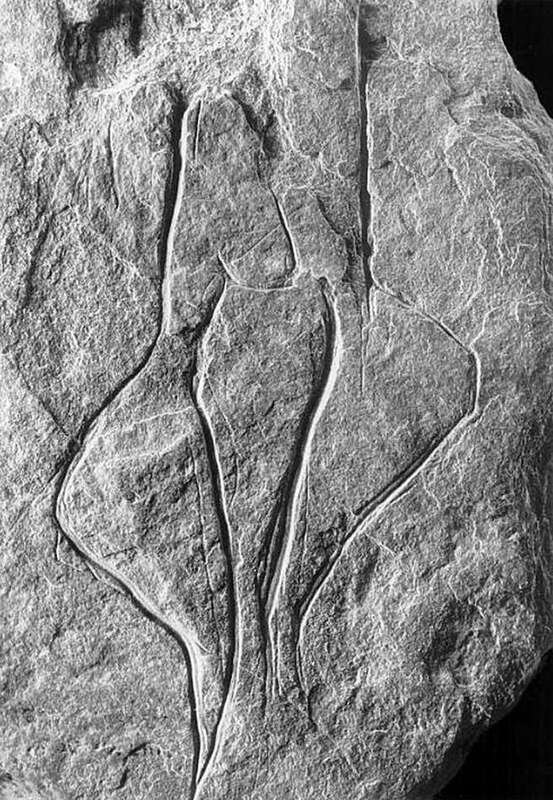 This is the obverse face of the venus figurine above. Ivory statuette with rod-shaped upper body. Height 54 mm, width 14 mm. 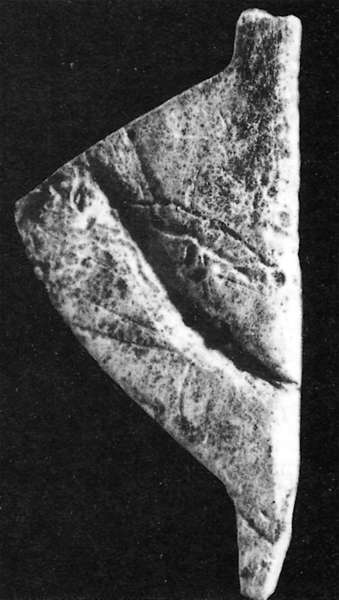 Fragment of an ivory statuette. 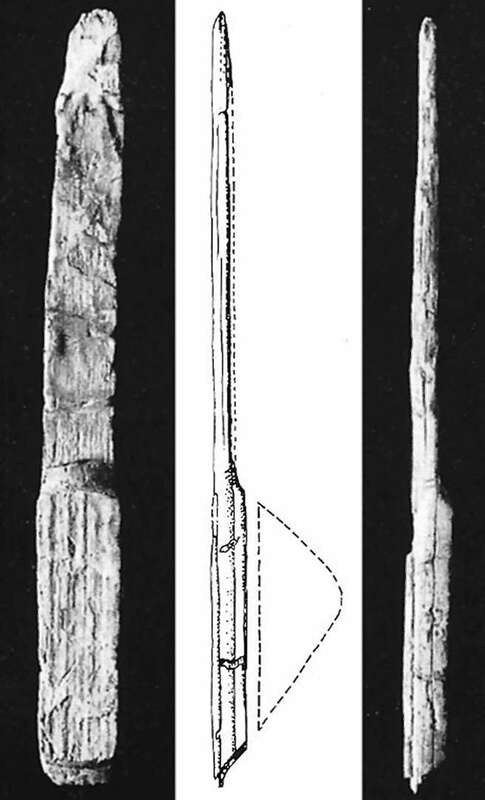 Ivory statuette with the the rod alone left. 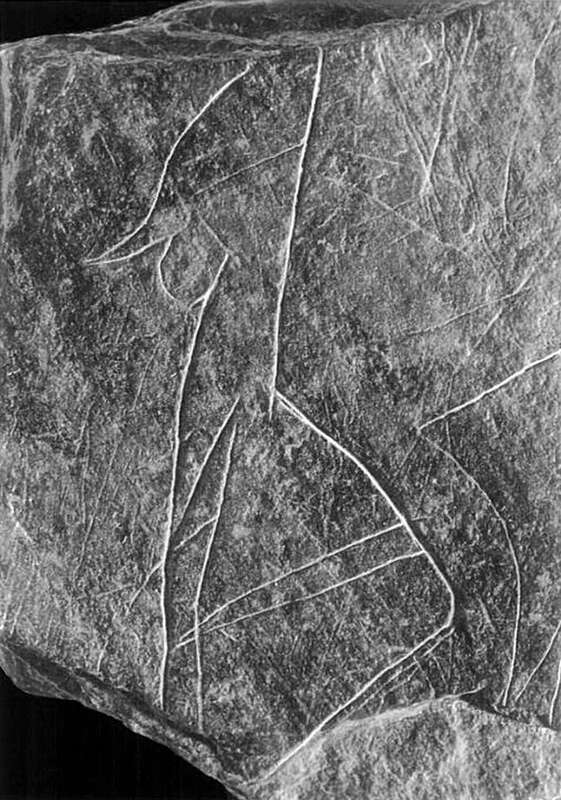 Engraving of lalinde venus figure, Gönnersdorf, Stadt Neuwied. 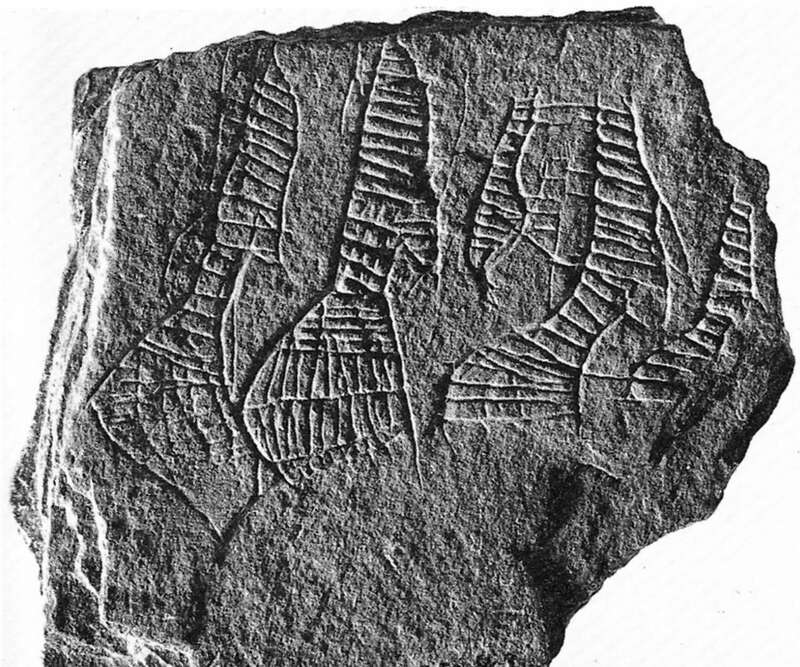 Engravings of lalinde venus figures, Gönnersdorf, Stadt Neuwied. 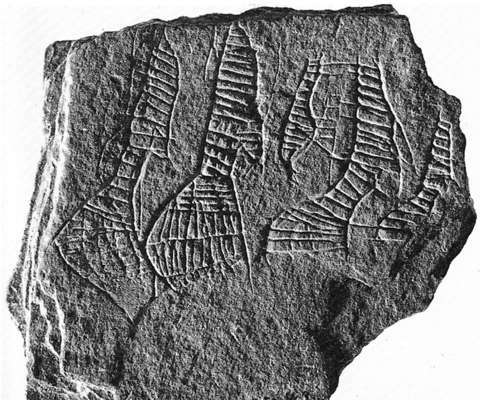 Engravings of lalinde venus figures, possibly dancing, Gönnersdorf, Stadt Neuwied. Engraving of a mammoth, Gönnersdorf, Stadt Neuwied. 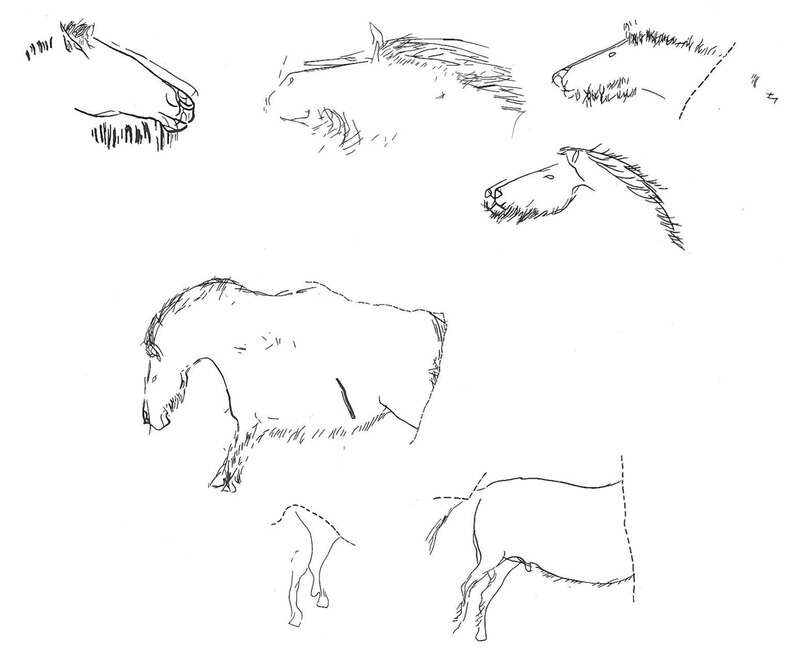 While these animal images from 15 000 BP are often very detailed, the female portrayals are quite stylised. 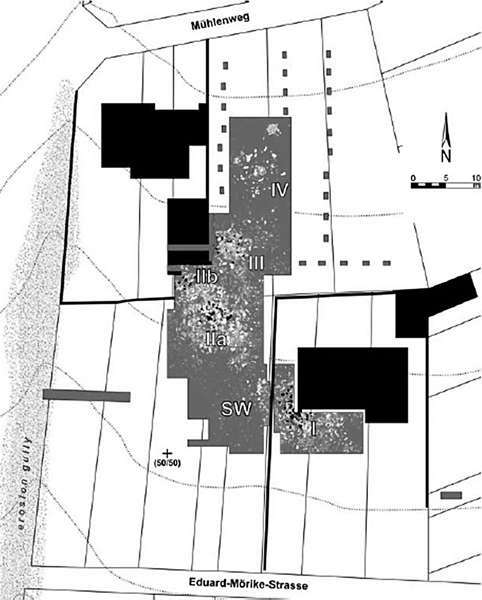 Plan of the Gönnersdorf excavation area (grey) showing the position of the Magdalenian settlement structures (K-I, K-IIa, K-IIb, K-III, K-IV and SW) in relation to modern buildings (black). 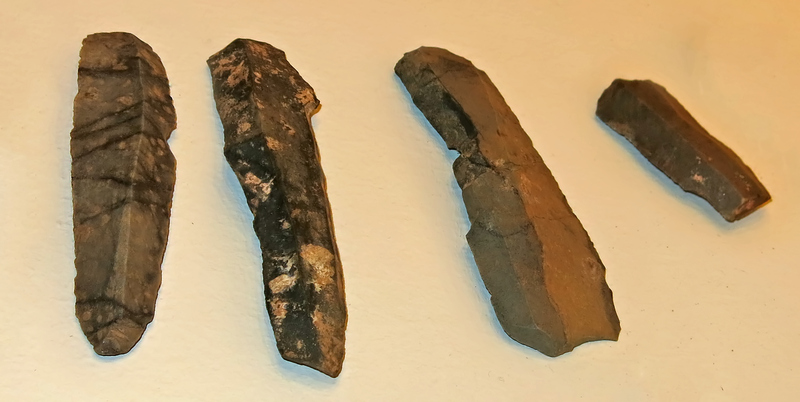 BF: Cretaceous 'Baltic' flint from moraine deposits (pale blue stippling); KS: indurated slate; TQ: Tertiary quartzite; CH: chalcedony and KOO: indurated oolite (white hatching); PQ: 'Palaeozoic' quartzite; WF: Cretaceous flint from primary chalk formations (white areas) and river terrace gravels (pale green stippling). AC: Aachen; D: Düsseldorf; K: Cologne; BN: Bonn; TR: Trier; KO: Koblenz;WI: Wiesbaden; MZ: Mainz; F: Frankfurt am Main. This piece shows an alignment of four female figures in a row. Behind the second figure from the right is a small figure sitting in a kind of holder. 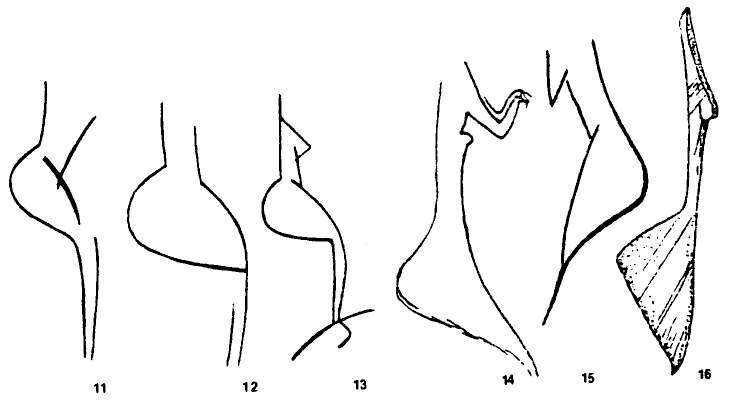 The posture of the second female figure from the right also has the stance associated with carrying a load. This presentation is without parallel, apparently a mother and child. 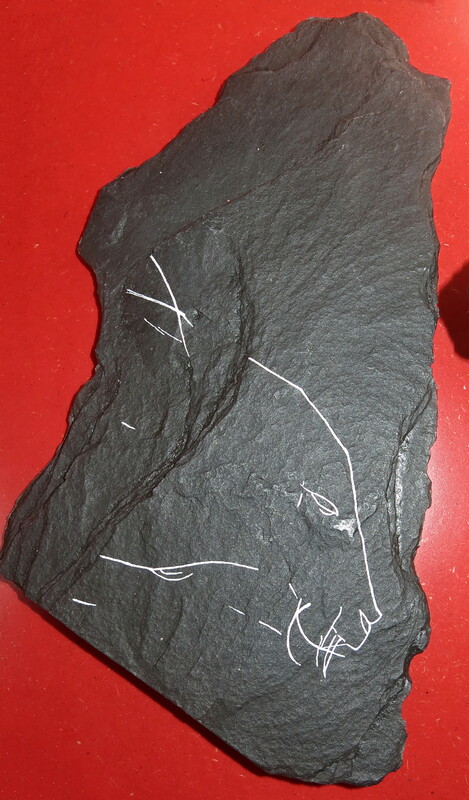 Engraving on slate. 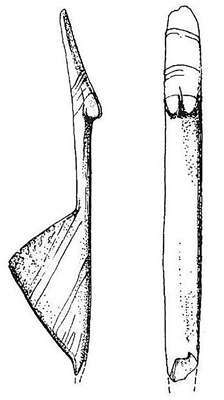 Height of the figure on the right 28 mm. Another version of the image above including a woman carrying a baby. Note that the baby is facing backwards in the cradle on the woman's back. 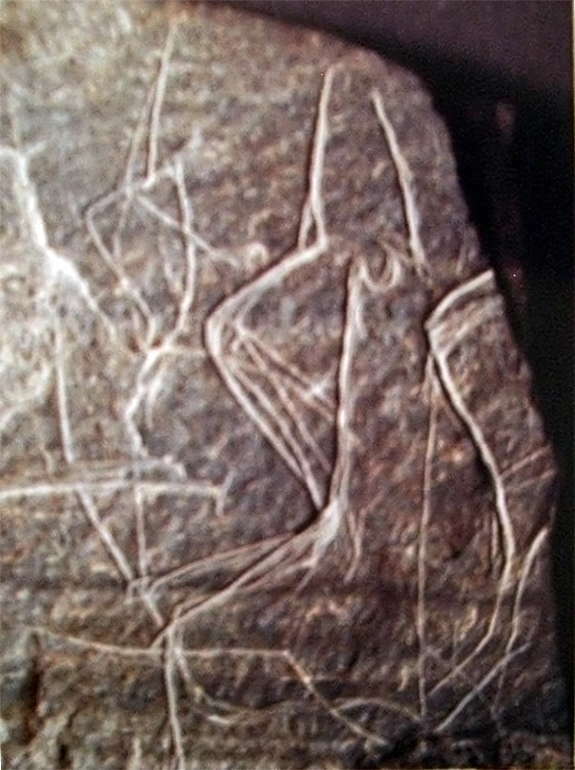 Another version of the woman carrying a baby. Representation of a hairy man. 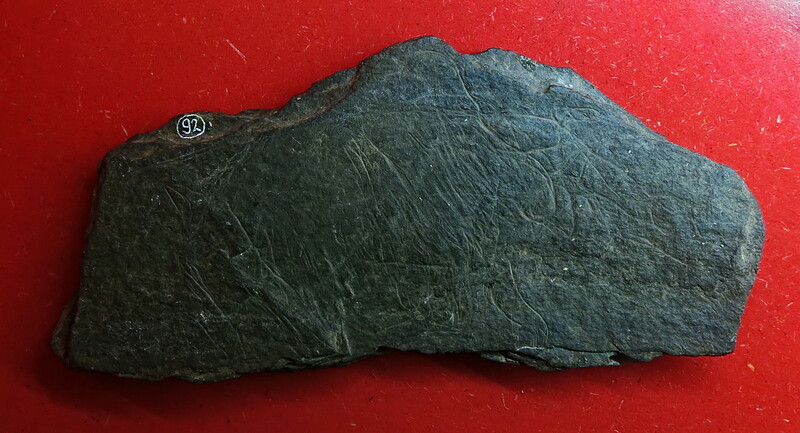 Engraving on shale. 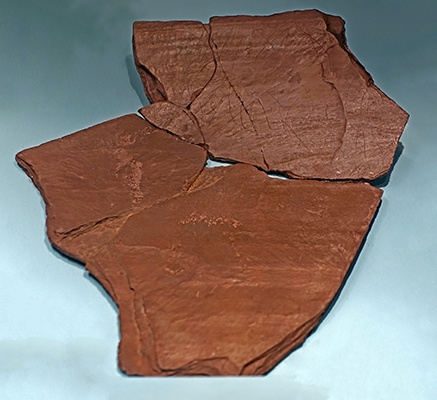 Plate fragment. Length 94 mm, breadth 47 mm. 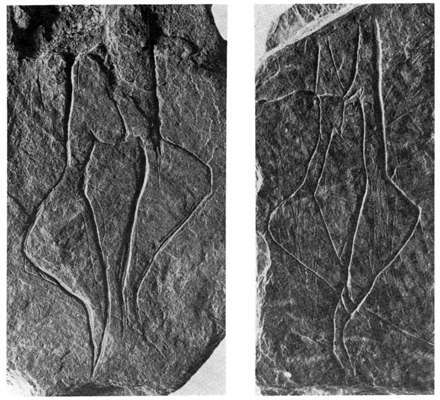 Two female figures, another version of the image on the left above. 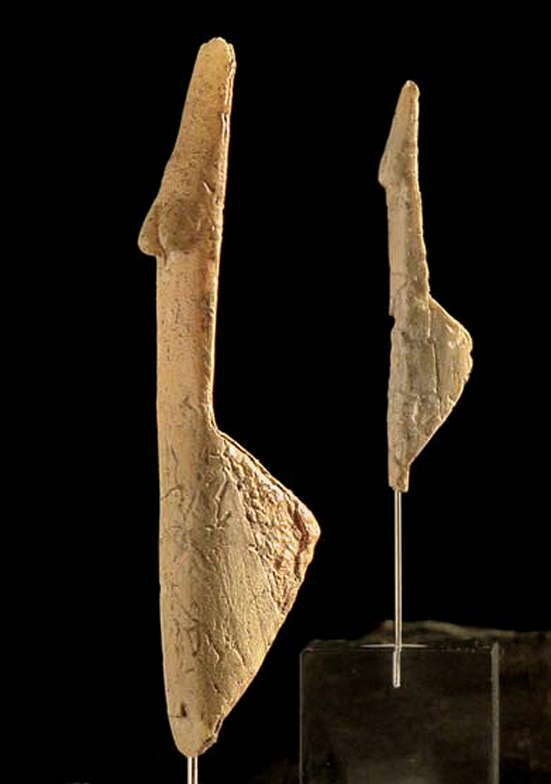 The two female figures from Gönnersdorf, in colour, foreshortened because of the angle at which the photo was taken. 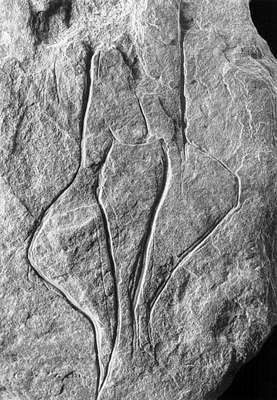 This is an unusual engraving of a classic Gönnersdorf venus, since an attempt has been made to portray the feet of the figure. Several lamps were found. The stones have been hollowed out, sometimes to depth of 1 cm, and tallow or fat was used as fuel, with a wick of plant fibres. Experiments have shown that such lamps can give the light of two or three candles, and burn steadily, without soot. A horse with flying tail engraved in stone. 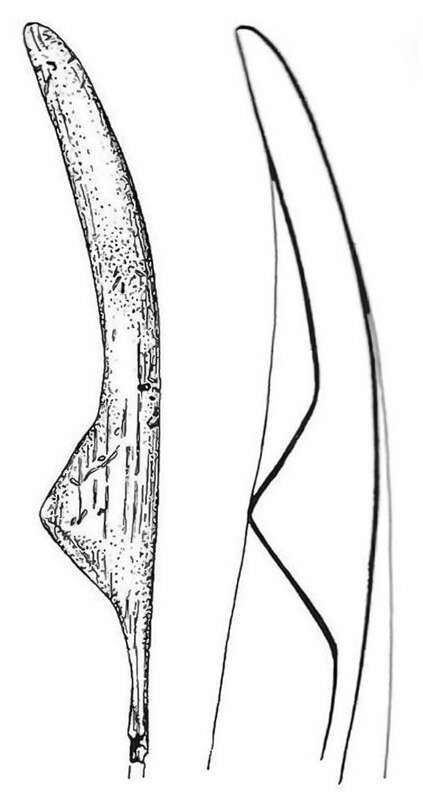 Engraving of a frog from Gönnersdorf. 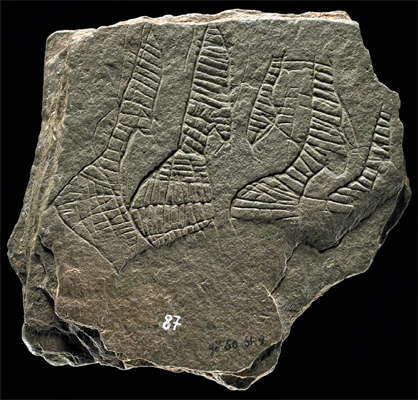 This is an interesting piece, with a series of Gönnersdorf figures engraved into a semi-cylindrical/conical piece of sandstone, from From 13 000 BP. 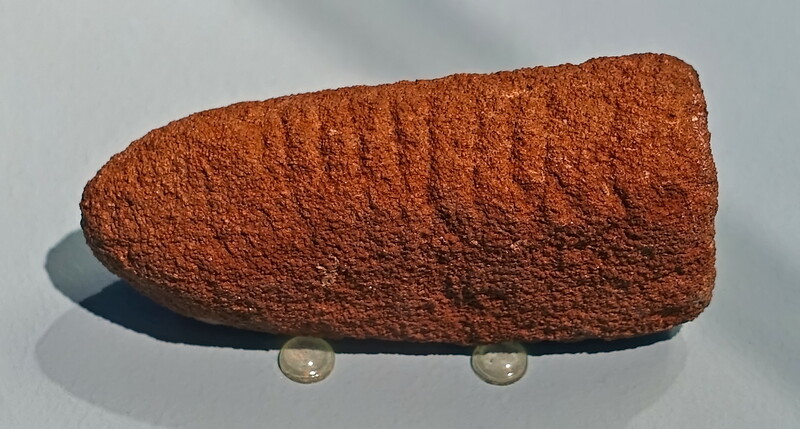 It is a sandstone shaft smoother. 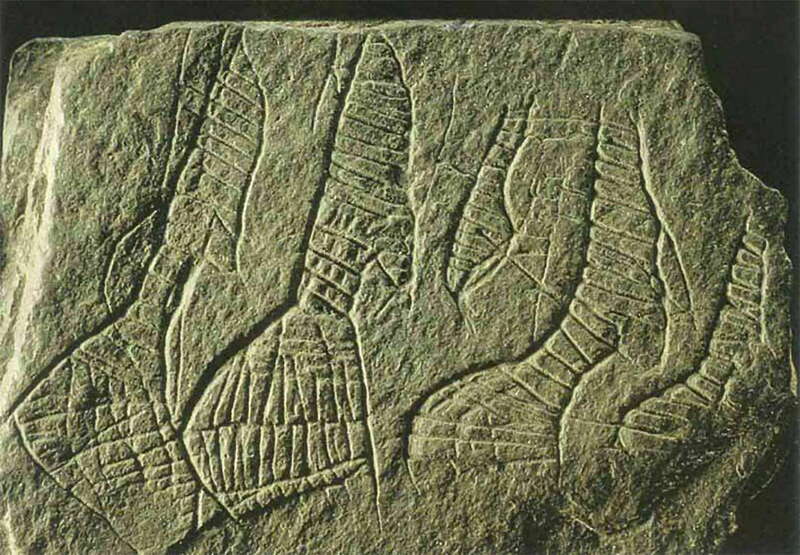 They were used in pairs, where the shaft of the spear was between the two pieces of sandstone. The women are dancing, in the Gönnersdorf and Andernach tradition. In the artistic manifestations of the late Palaeolithic, in contrast to the previous art of the Magdalenian, the art is often displayed on moose antler. 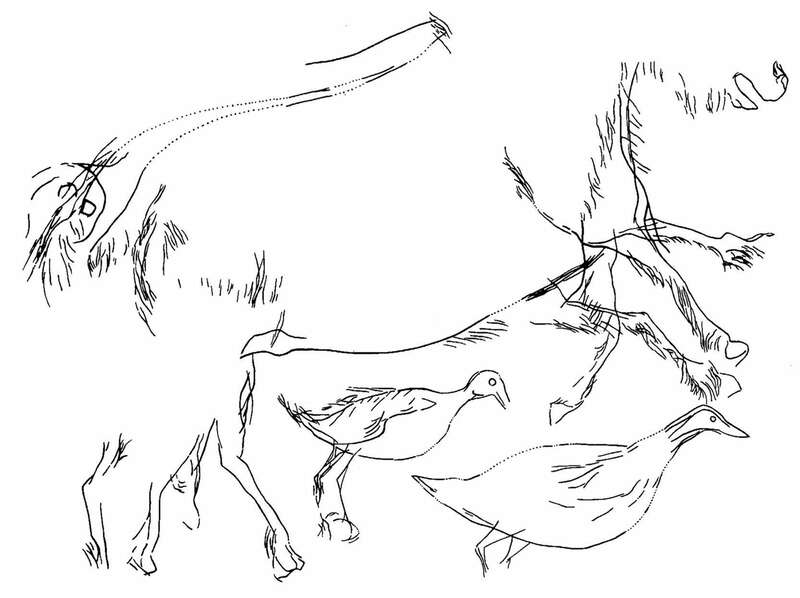 This is no accident, but rather represents the typical prey of the hunters in the dense forest of this time. Lender of the piece: Directorate General for Cultural Heritage Rhineland-Palatinate, Generaldirektion Kulturelles Erbe Rheinland-Pfalz. The figures above can only be made out clearly in the drawing which accompanies the piece. This image shows the other side of the arrow shaft smoother shown above. 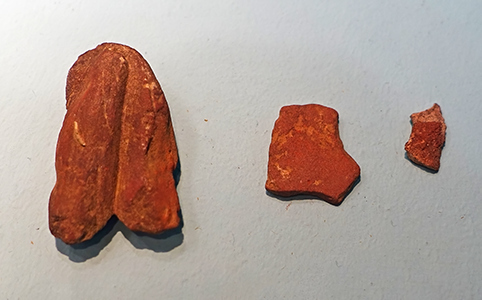 The object, made ​​of red sandstone, was discovered at the Palaeolithic archaeological site Niederbieber in the Neuwied Basin during excavation of area II 1981. The 71 x 34 x 22 mm piece has both engravings on the back engravings and is also a functionally outstanding reference object forNiederbieber. 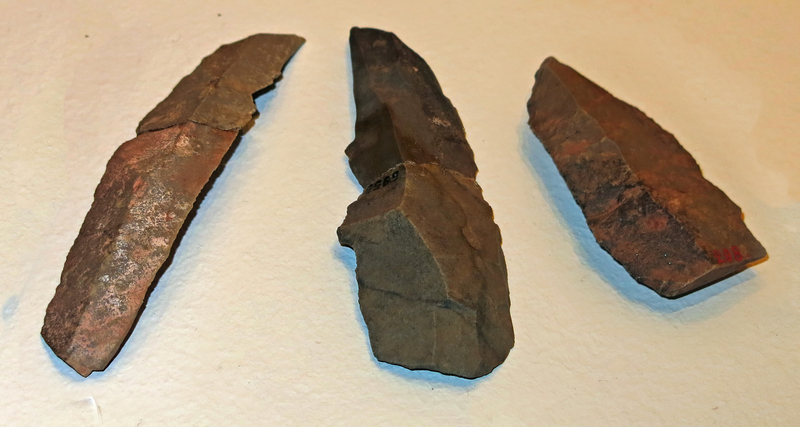 They were used in pairs were used for grinding wooden arrow shafts and are in addition to the characteristic stone tool types (penknife) of the late Palaeolithic an indirect indication of the beginning of the time when bows and arrows were used as hunting weapons. 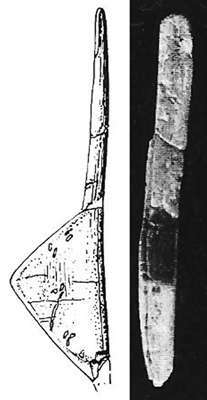 In Niederbieber this arrow shaft shaper delivers an additional proof of the new production or repair (hafting and retooling) of hunting weapons. 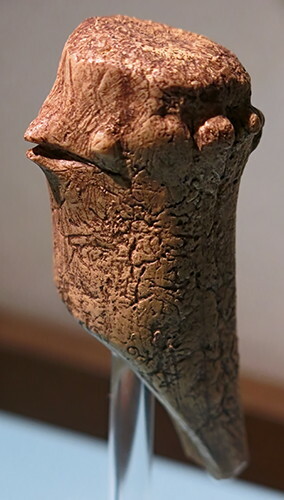 The unusual decoration of shaft smoother with stylised female figures of the Gönnersdorf type is one of the rare instances of the artistic work of this time. 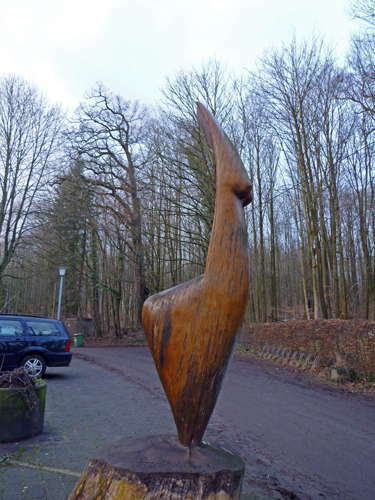 It provides a unique reference to the survival of the tradition of Gönnersburg/Lalinde female representation. Pierced horse tooth, Gönnersdorf, Stadt Neuwied. From the same levels as the Gönnersdorf venus figures. Dauerleihgabe des Vereins von Altertumsfreunden, On permanent loan from the Friends of the Antiquity Association. Haematite, one piece with a groove from the grinding of red ochre powder, Gönnersdorf, Stadt Neuwied. 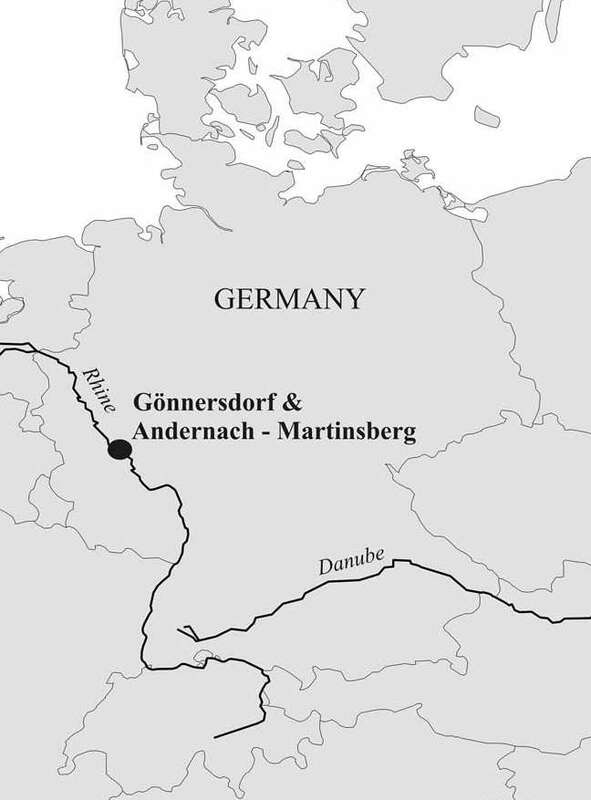 This map shows the close spatial relationship between the sites of Gönnersburg, Andernach, and Niederbieber. 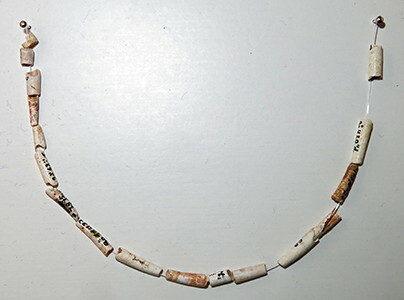 Necklace of tusk shells from Neuwied-Gönnersdorf, Rheinland-Pfalz, 15 000 BP. 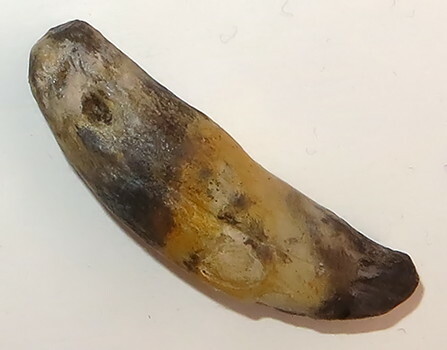 The tusk shells or tooth shells, often referred to by the more-technical term scaphopods, are members of a class of shelled marine mollusc with worldwide distribution, and are the only class of exclusively infaunal marine molluscs. 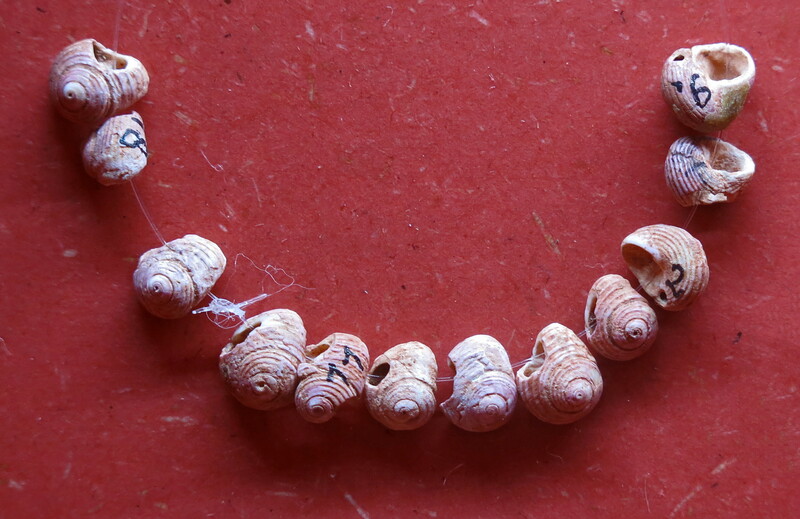 Shells of species within this class range from about 0.5 to 15 cm in length. 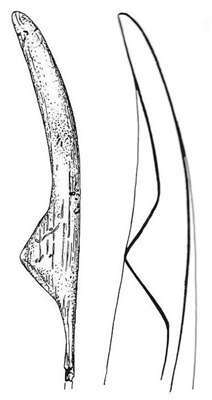 Members of the order Dentaliida tend to be significantly larger than those of the order Gadilida. 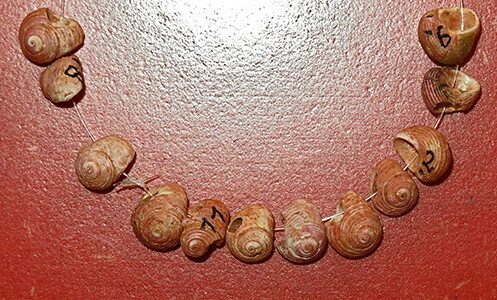 These molluscs live in soft substrates offshore (usually not intertidally). Because of this subtidal habitat and the small size of most species, many beachcombers are unfamiliar with them. Their shells are not as common or as easily visible in the beach drift as the shells of sea snails and clams. Necklace of shells from Andernach, Rheinland-Pfalz, 15 800 BP. 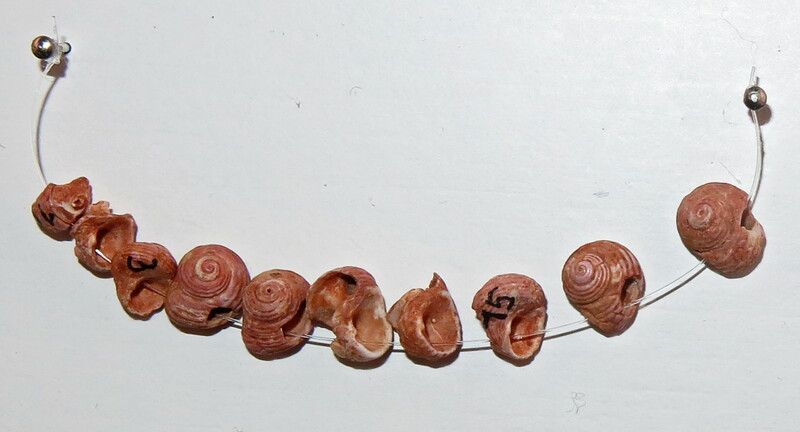 These are pierced snail shells from the Mediterranean Sea, Cyclope neritea, synonym of Tritia neritea, otherwise known as Nassa mud snails or dog whelks. 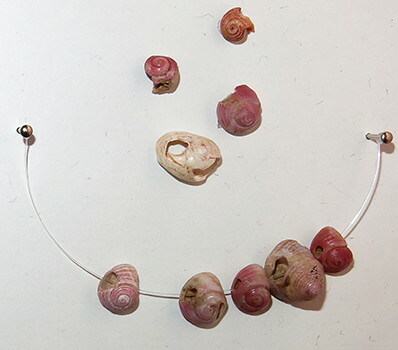 Jewellery - perforated snail shells from the Mediterranean Sea. 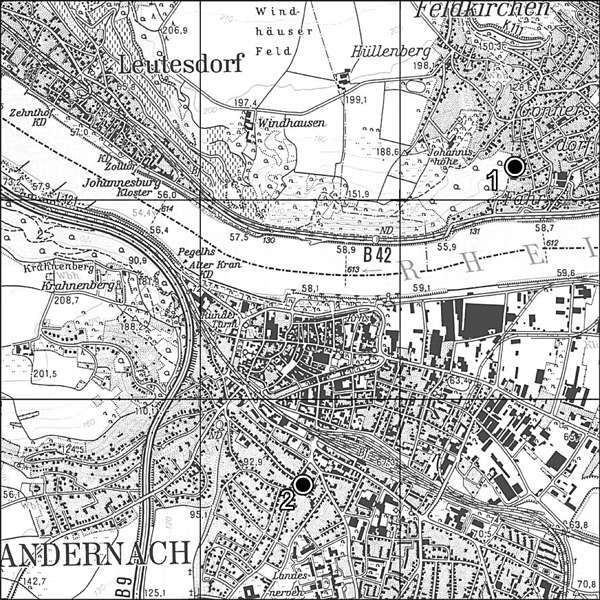 Andernach, Rheinland-Pfalz, 15 800 BP. 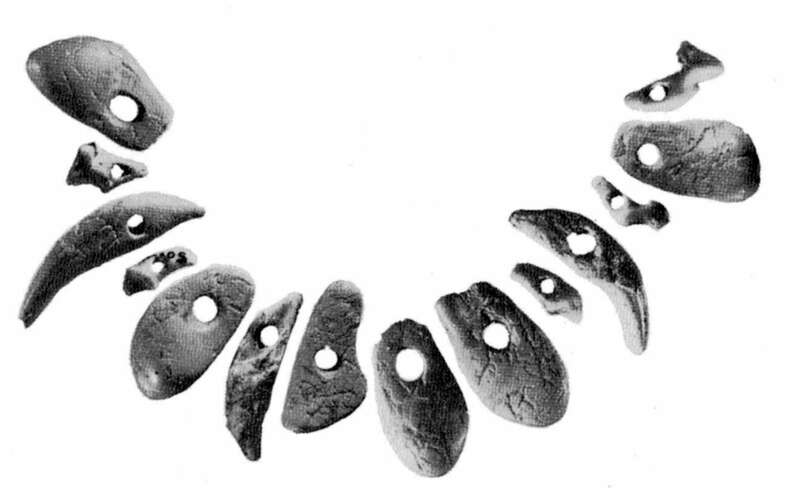 Necklace of shells from Sprendlingen, Rheinland-Pfalz, 27 000 BP - 31 000 BP. These are pierced snail shells, Homalopoma sanguineum, which is a pink or reddish herbivorous snail which lives on rocks and other surfaces in the Mediterranean Sea, feeding on algae. Perforated teeth and lower jaw of the arctic fox, Vulpes lagopus. From Neuwied-Gönnersdorf, Rheinland-Pfalz, 15 800 BP. Reindeer teeth necklace, from Andernach, Rheinland-Pfalz, 15 800 BP. 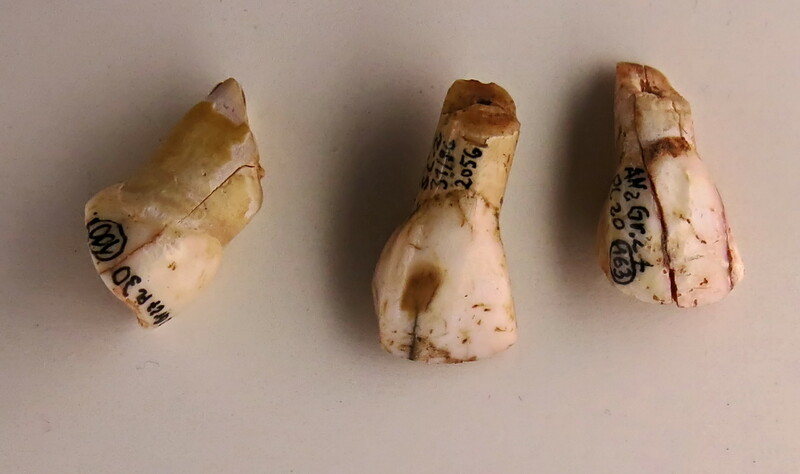 Pierced Red Deer canines, or Hirschgrandeln, from Neuwied-Gönnersdorf, Rheinland-Pfalz, 15 800 BP. 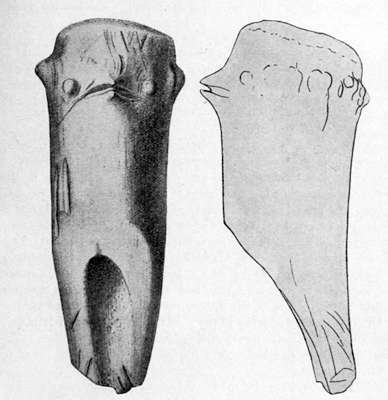 Aurochs cutting incisors from Neuwied-Gönnersdorf, Rheinland-Pfalz, 15 800 BP. 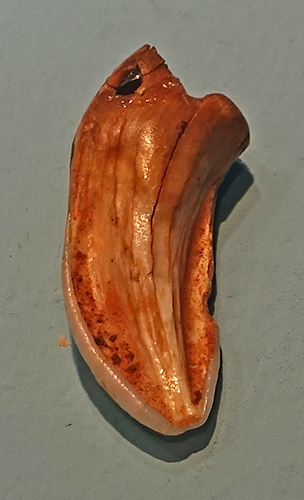 Wolf tooth with the beginnings of a piercing from Wildscheuer, Hessen, 34 800 BP - 40 000 BP. 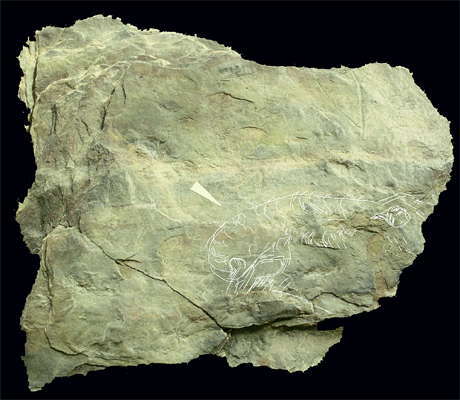 The Wildscheuer cave was destroyed by limestone mining, and was about 50 km from Neuwied. (left) Pendant made from a horse's tooth, from Wildscheuer, Hessen, 34 000 BP - 40 000 BP. 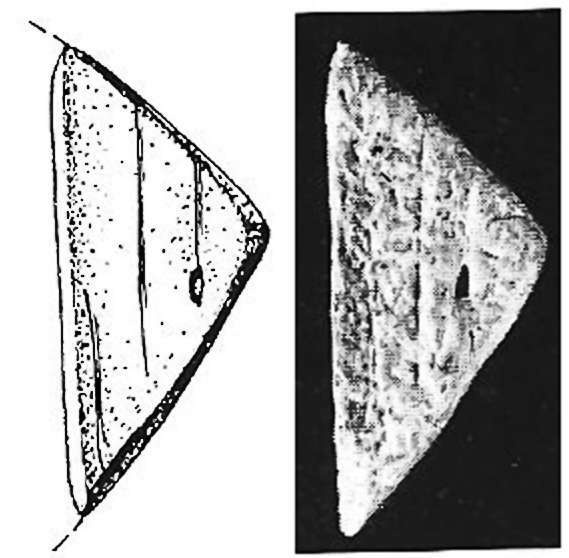 (right) Zigzag design on bone, from Wildscheuer, Hessen, 34 000 BP - 40 000 BP. Stone pendant and beads from Wildscheuer, Hessen, 35 000 BP. Pendant made from jet, from Neuwied-Gönnersdorf, Rheinland-Pfalz, 15 800 BP. 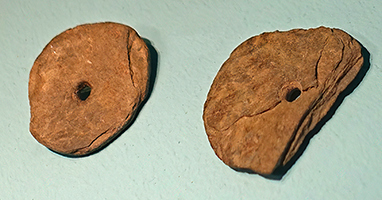 Beads made from jet, from Ölknitz, Thuringen, 15 500 BP. 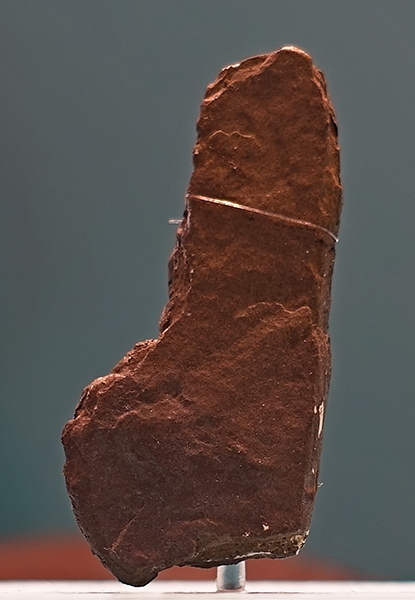 Included in the display is a double ended perçoir, of the type which would have been used to pierce the pieces shown. 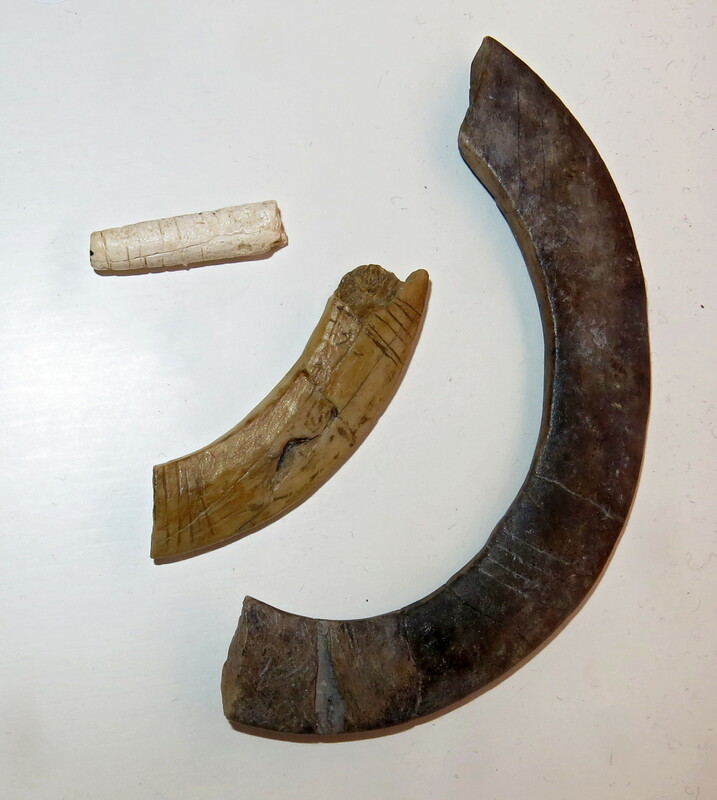 (upper left) Pendant of mammoth ivory, from Neuwied-Gönnersdorf, Rheinland-Pfalz, 15 800 BP. 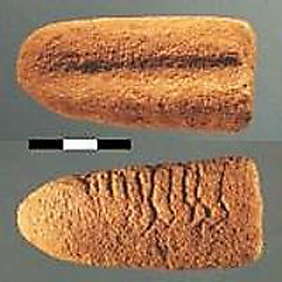 (right) Mammoth ivory rings, Magdalenahöhle, Rheinland-Pfalz, 20 000 BP - 35 000 BP. Magdalenahöhle is especially known for its unique ivory jewelery, and for the fact that although it is in central Europe, it demonstrates the presence of people there during the last glacial maximum during the Solutrean. Animal teeth pierced for use as a necklace or as pendants. 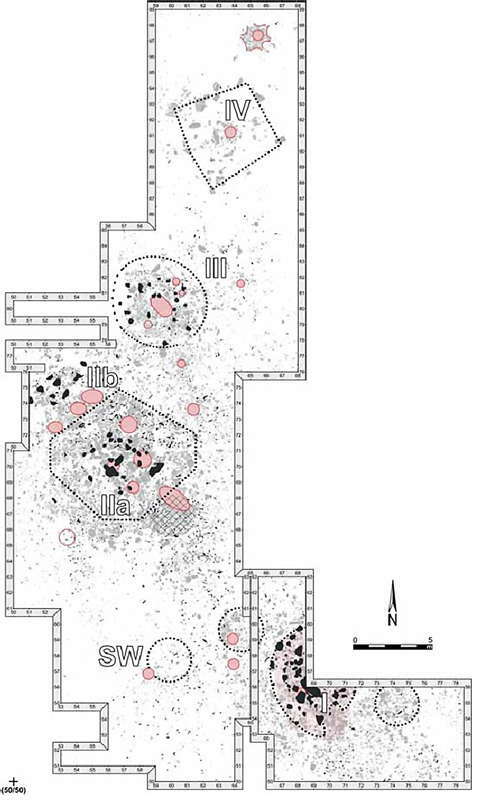 Plan of the Gönnersdorf 'Planum I' excavation surface showing slabs and blocks (pale grey) and artificial pits (black) and the location of evident and latent settlement features. Hatching plots an area of intense find deposition (working area / dump?) adjacent to K-IIa. Every evening, this large basalt block was heated in the fire under the coals, and finally carried into the tent. 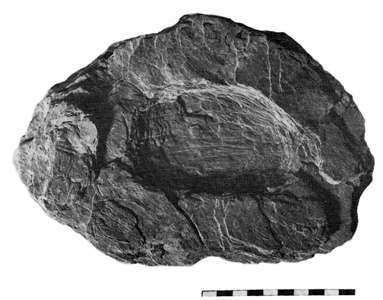 The stone gave off its stored energy overnight and thereby provided pleasant warmth for the sleepers. 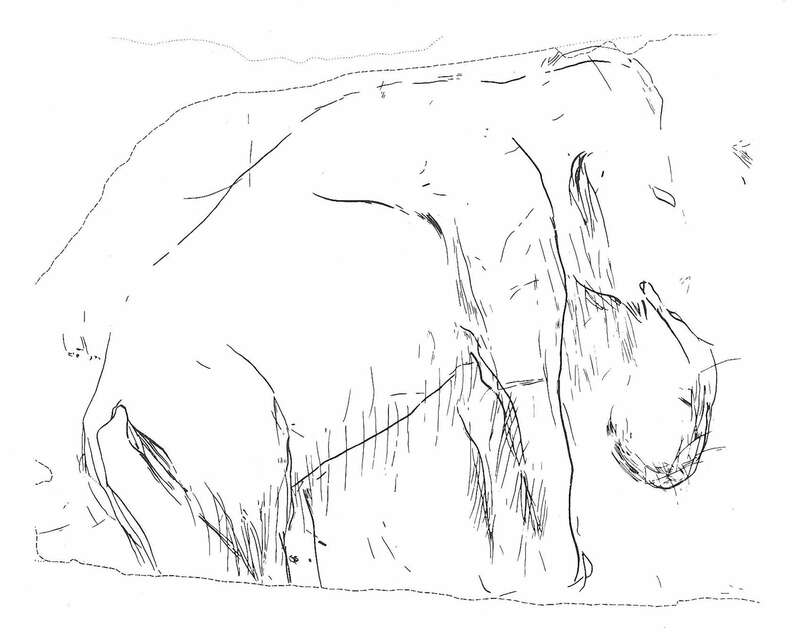 This is a superb sketch of a mammoth. It is both anatomically correct and shows artistic merit. This is a good drawing of the engraving above. This is a freer sketch of a mammoth, also from Gönnersdorf. 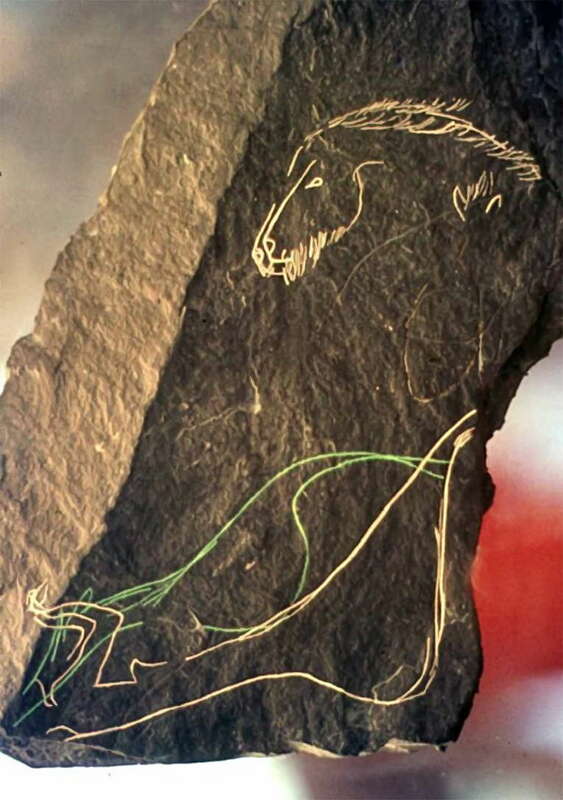 Mammoth, original, engraving in slate from Neuwied-Gönnersdorf, Rheinland-Pfalz, 15 800 BP. 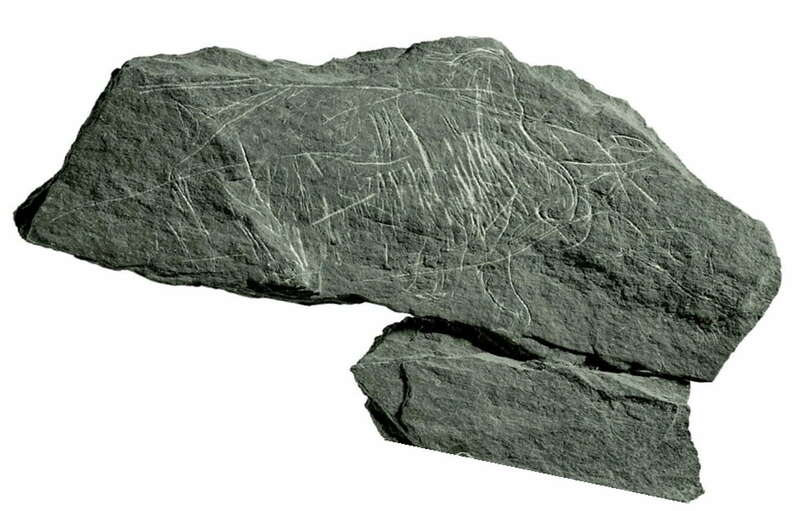 Seal, facsimile, engraving in slate from Neuwied-Gönnersdorf, Rheinland-Pfalz, 15 800 BP. In marked contrast to the naturalistic portrait of a seal, above, this engraving of a bird looks more like a modern cartoon of the Road Runner! 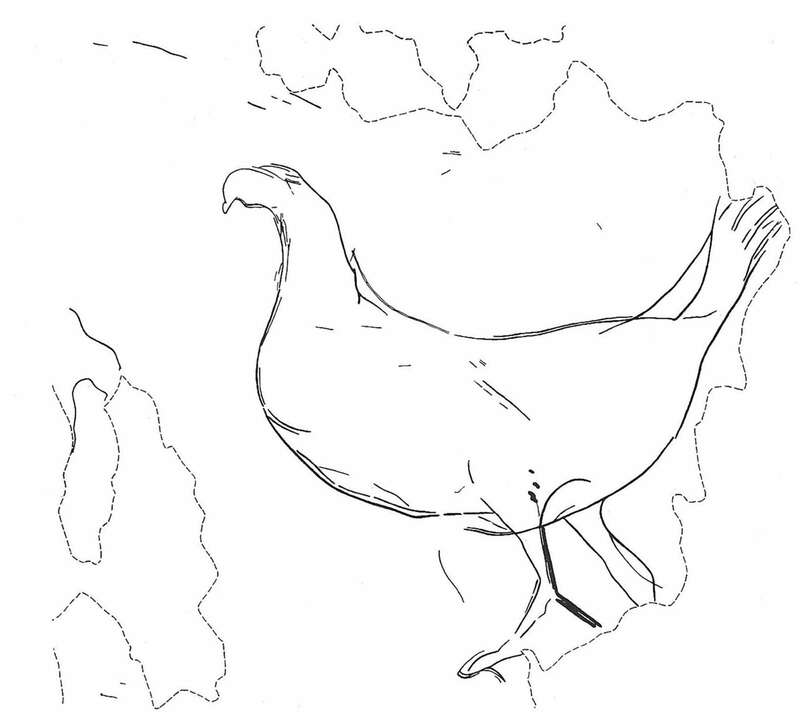 A colour image of the bird shown above. 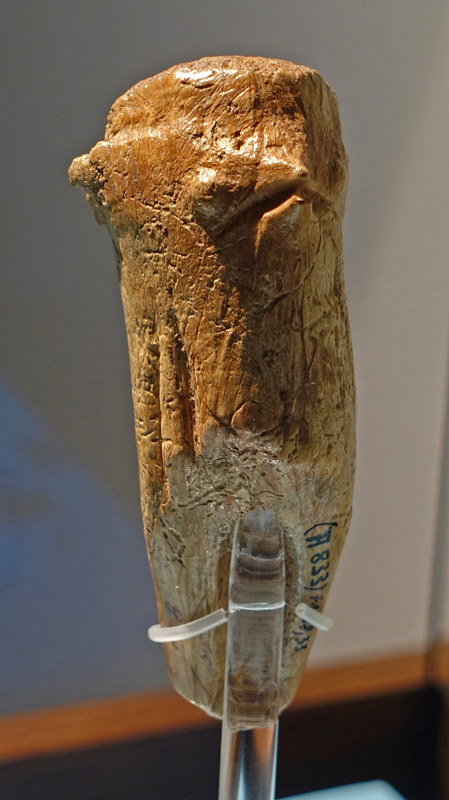 Whale bone spear tip, original, from Andernach, Rheinland-Pfalz, 15 800 BP. 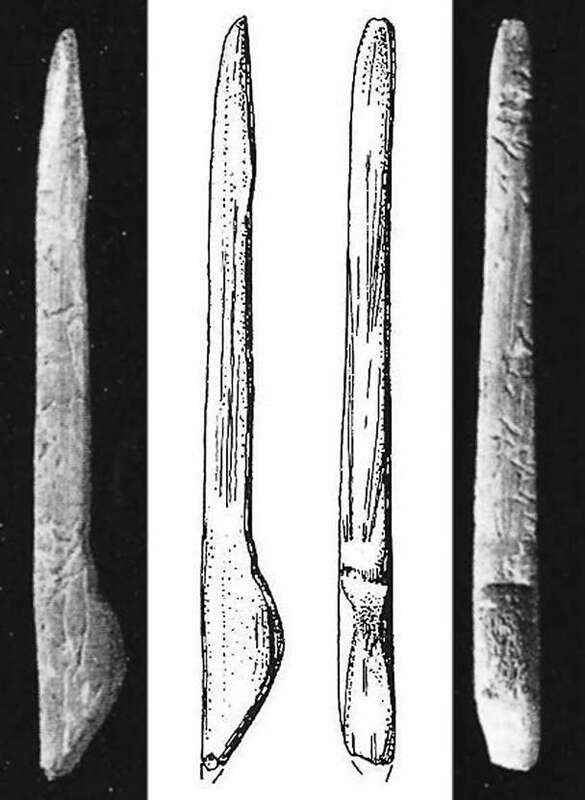 Fragments of harpoons, in antler, from Andernach, Kreis Mayen-Koblenz. 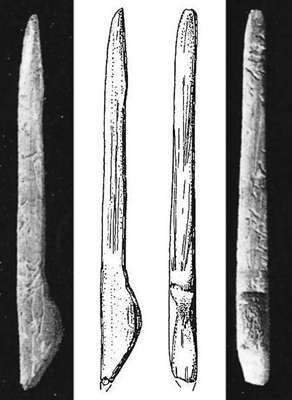 Bone needles, from Andernach, Kreis Mayen-Koblenz. On loan from : Directorate General for Cultural Heritage Rhineland-Palatinate, Generaldirektion Kulturelles Erbe Rheinland-Pfalz. This illustrates just one of the many possible uses suggested for bâtons percés or perforated batons. Made of antler themselves, dozens of uses have been proposed for these tools. In this case it is proposed that two perforated batons were used to straighten a long, curved strip of antler. 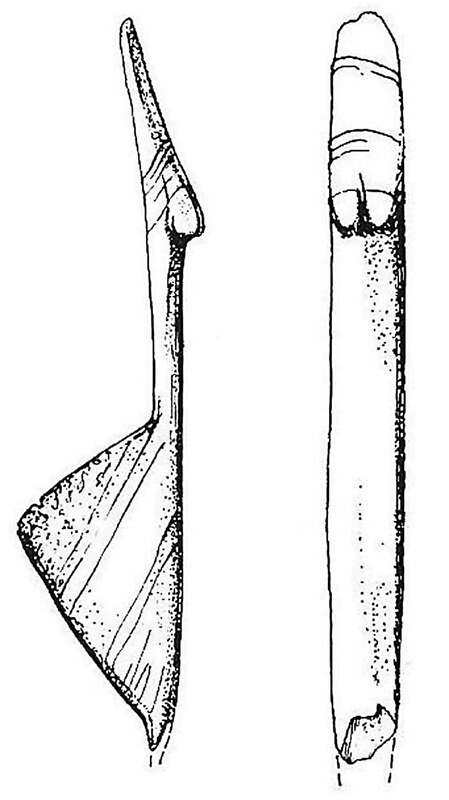 This seems an unlikely situation, since antlers of both reindeer and red deer were in plentiful supply at various (different) times, and it would have been possible to choose a very much straighter strip of antler to use for, say, a harpoon, though perforated batons could have been used to straighten any residual curvature. 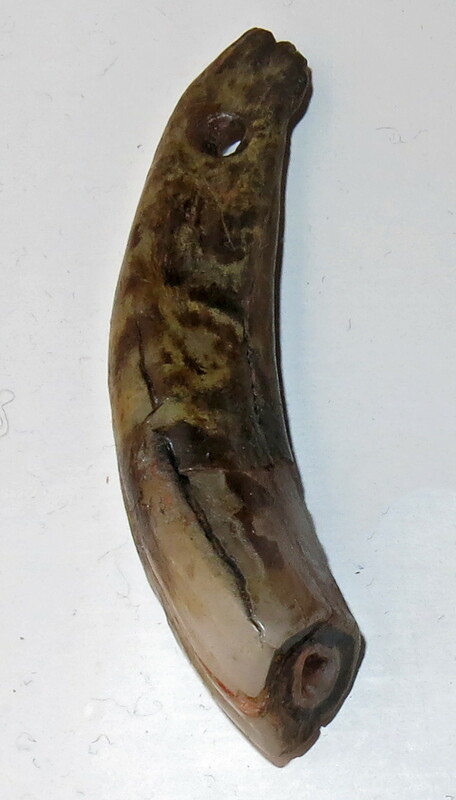 However it is far easier to soak the antler in water for a week or two before attempting to straighten it. Then the strip of antler should be bound tightly along its whole length to a strong straight piece of thick strong wood, and left to dry. Perforated batons are simply not necessary or desirable in this instance. 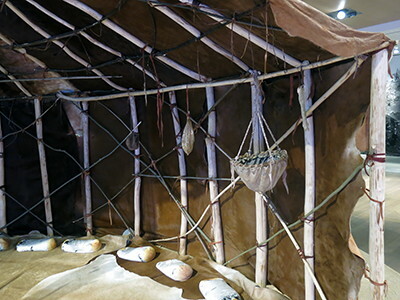 In modern times, antler is boiled in water for an hour or so, after which treatment it is easily bent and clamped to the desired shape, and left to dry overnight, after which it retains the new shape, straight or curved. 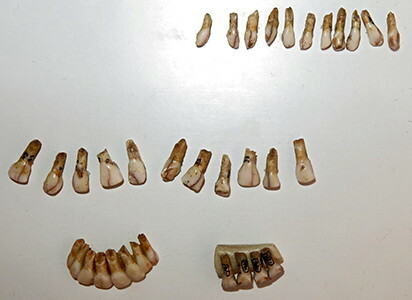 Reconstruction: Dr J. Tinnes, Cologne. Köln. 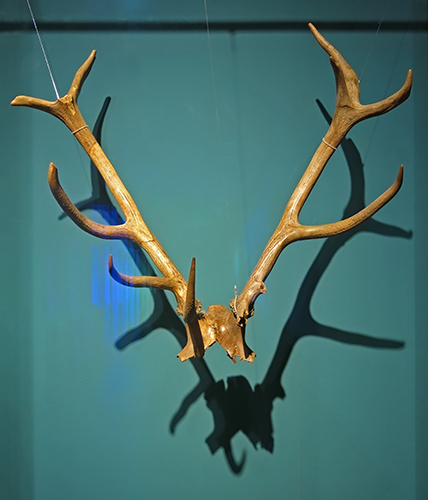 Red deer antlers, used as part of a shaman's mask. 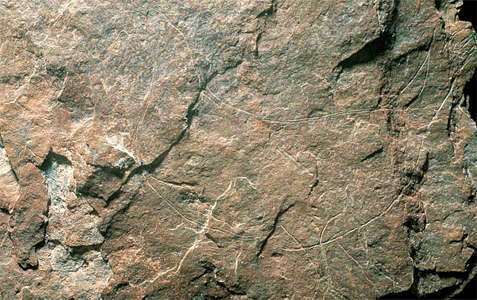 The cult of the deer has a very great significance in the ideology of primeval peoples of the Eurasian forest zone. 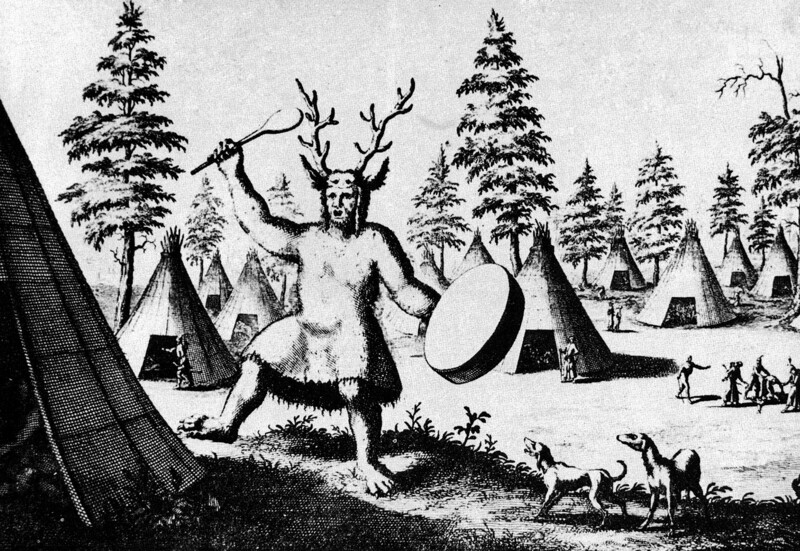 This cult includes myths and rituals connected with the worship of the deer or man-deer, the ancestor of people and deer, and a cultural hero, the teacher of deer hunting. The most important evidence supporting the cult of the deer in traditional societies are totemistic mysteries connected with the reproduction of deers, and magic hunting rituals. The most important participant in these rituals is the shaman. Tungus shaman of the 18th century, wearing a head dress including antlers. 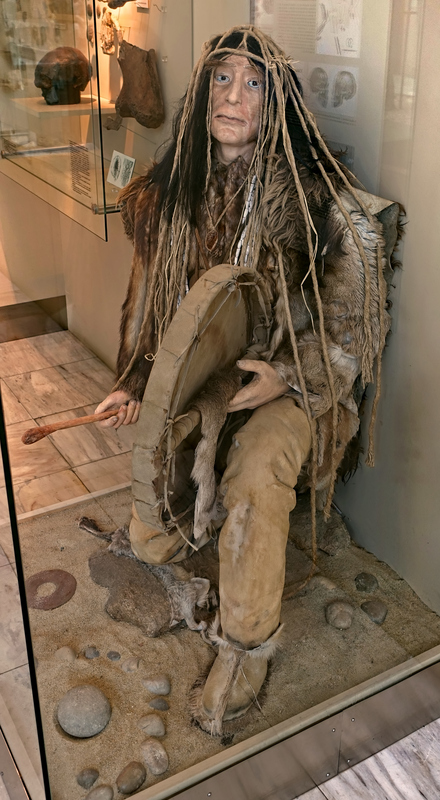 Gravettian Shaman from the Pavlov/Milovice area. Saiga Antelope, Gönnersdorf. 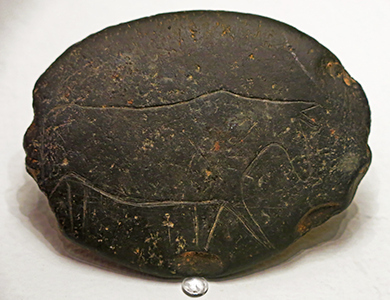 The engraving shows just the head of the animal, with its characteristic snout. 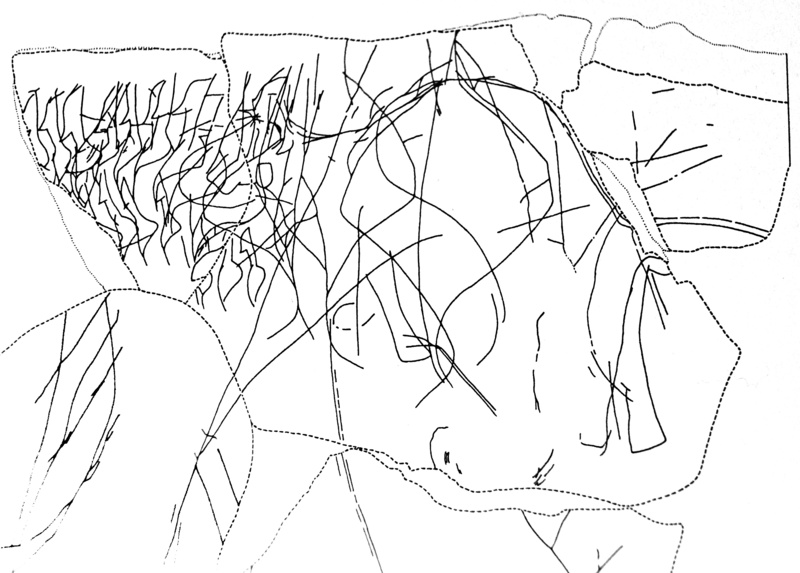 The image has been outlined in order to make the form clearer. 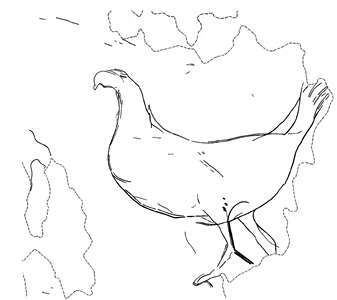 Known simply as Ptarmigan in Europe and colloquially as Snow Chicken or Partridge in North America, Lagopus muta is a medium-sized gamebird in the grouse family. 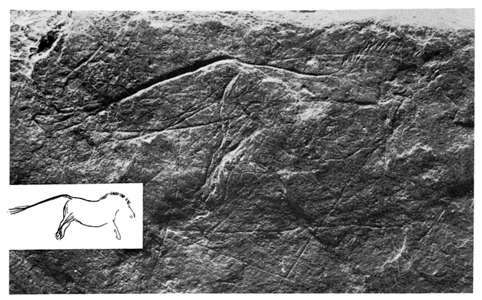 The original of the drawing above. Figure of a bird made in reindeer antler by emphasising a natural resemblance with some carving. Found at Andernach. This uniquely shaped representation of a bird was discovered in 1883 by H. Schaaffhausen at an excavation in Andernach-Martinsberg. It was carved with just a few strokes from the remains of a reindeer antler obtained as a waste product when making a tool of some kind. The inner spongy part of the antler has been eroded. Perhaps the piece was originally put on top of a wooden rod, as can be seen for the famous bird on a pole at the Shaft in Lascaux. 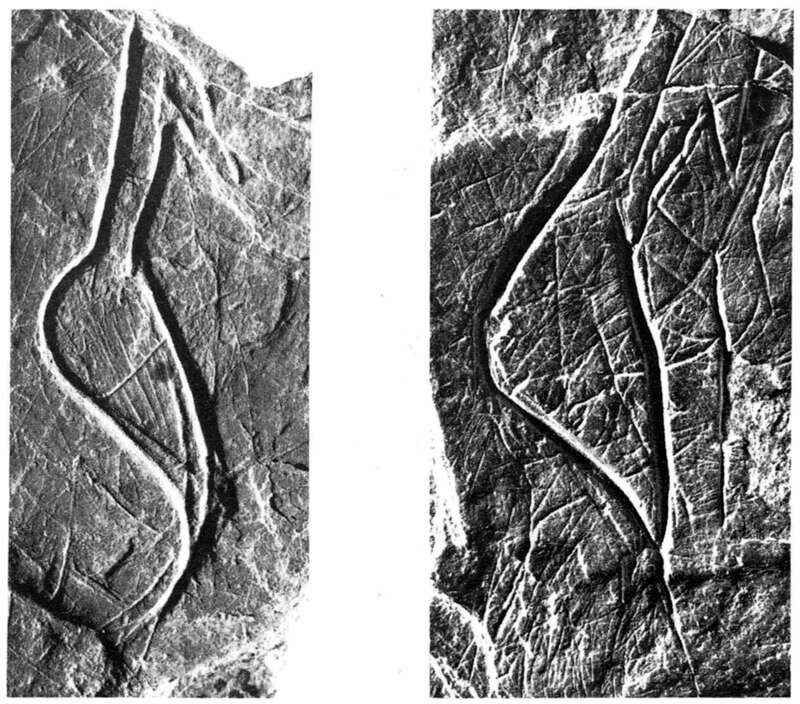 These two images complete a 360° circuit of the artefact. 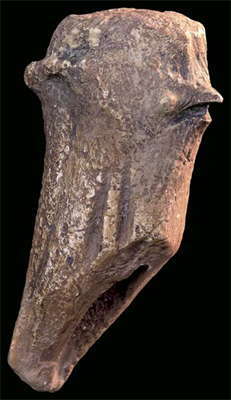 Carved Bird Head as shown above, another version. Reindeer, chalked to better show the engraving, from Andernach. 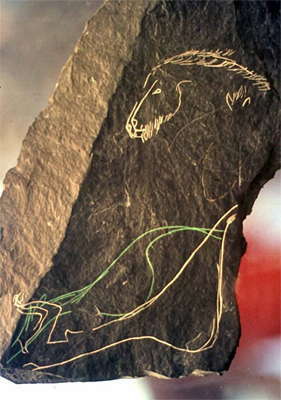 Engraving of a horse, in three dimensions, on green slate. 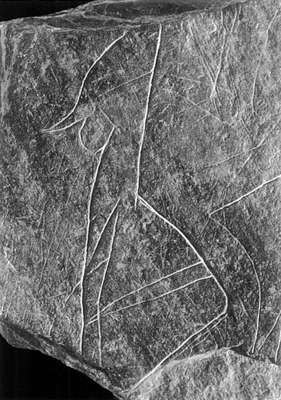 A simple drawing of what is possibly a hare. Chalked to better show the outline. Rondelles made of slate, from Gönnersdorf, City of Neuwied. 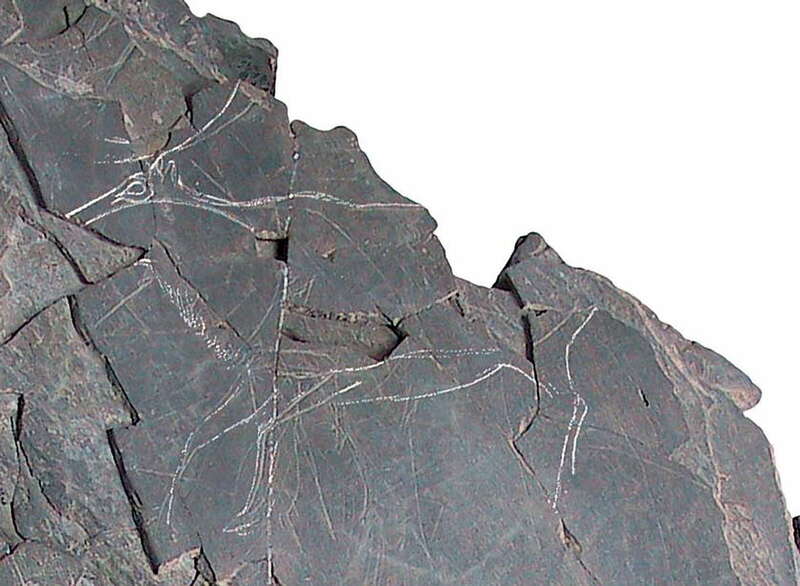 In the Gönnersdorf and Andernach area, near the dwellings were found numerous rondelles. These are round, pierced in the middle, mainly slices of shale, but some were made of ivory and reindeer antler. In Gönnersdorf alone 400 such rondels were found. There are many examples of discs or rondelles with central holes from various (mostly Magdalenian) sites in Europe. Various theories have been put forward as to their use, including clothing decoration and large buttons. 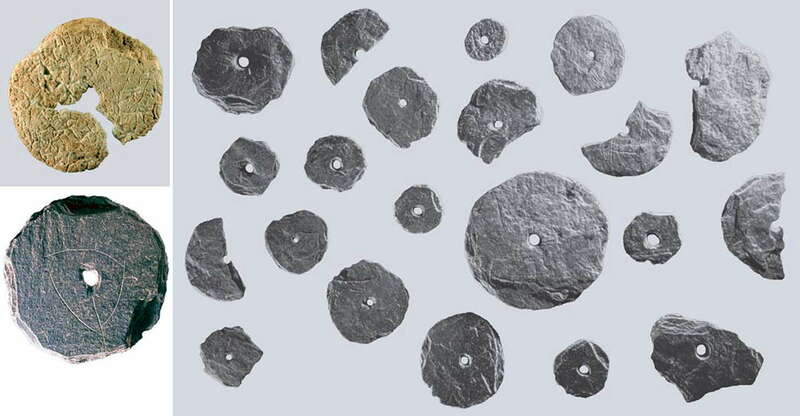 As my colleague AnnDee first pointed out, their most likely use is as the weight (normally called a whorl) for a drop spindle, in the spinning of fibres into yarn. This is borne out by the fact that the overwhelming majority have a central hole, all of similar dimensions, 2 to 4 mm, and by the fact that many are not decorated in any meaningful or artistic way, and are also made of other materials (sandstone, slate) as well as bone. In the Gönnersdorf area, colouring agents were used, such as the Hematite shown here, as well as ochres and charcoal. The urge to decorate oneself is as old as man himself. Only the forms and materials of the jewellery changes. Numerous trinkets and waste from their manufacture were found in both Gönnersdorf and Andernach. The spectrum of materials ranged from the bones and teeth of the available animals to fossils to snails and shells. Shiny black jet was used in Gönnersdorf and Andernach for jewellery, as well as these these pierced deer teeth from Gönnersdorf, Hirsch Grandeln, sometimes called hunting trophies, which were used as pendants or as ornaments for clothing. 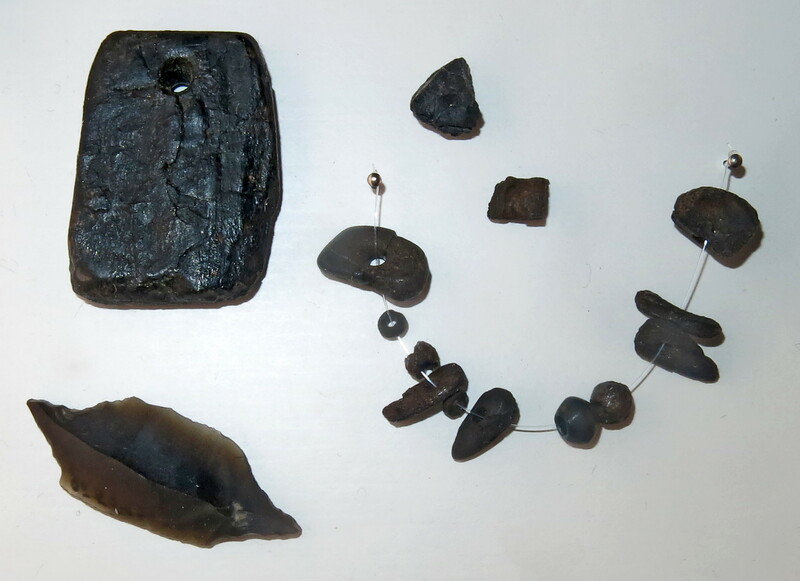 Drill made ​​of flint and jewellery from fossil wood (Gönnersdorf). 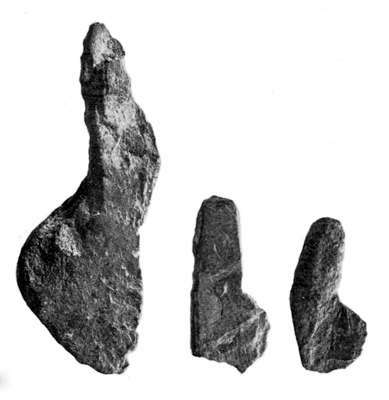 Andernach-Martinsberg, district of Mayen, Koblenz, from the excavations of Hermann Schaaffhausen 1883. 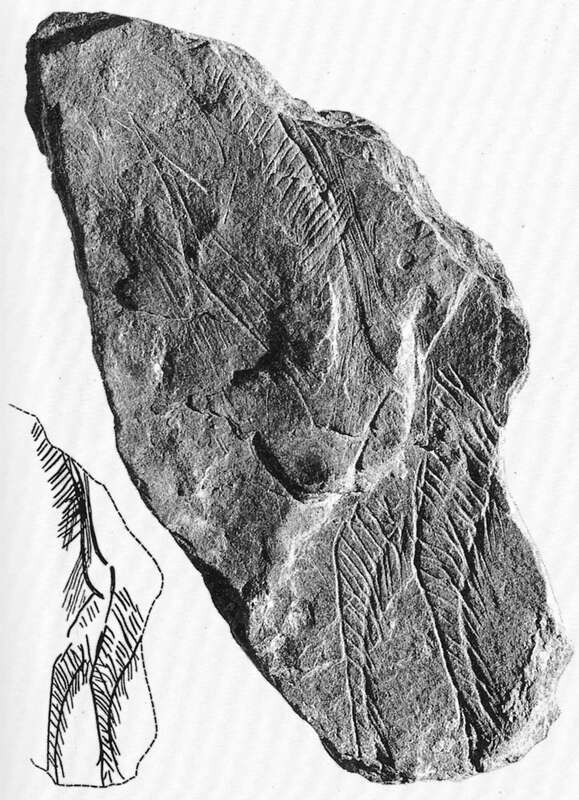 Andernach-Martinsberg, district of Mayen-Koblenz, from the excavations of Hermann Schaaffhausen 1883. Dr Gerhard Bosinski in 1963 became Assistant Professor at the Institute of Prehistory and Early History of the University of Cologne, becoming professor there in 1972. As a visiting professor he taught at the Universities of Berlin, Bordeaux , Göttingen and the University of the Saarland in Saarbrücken. In 2003 he became professor emeritus . 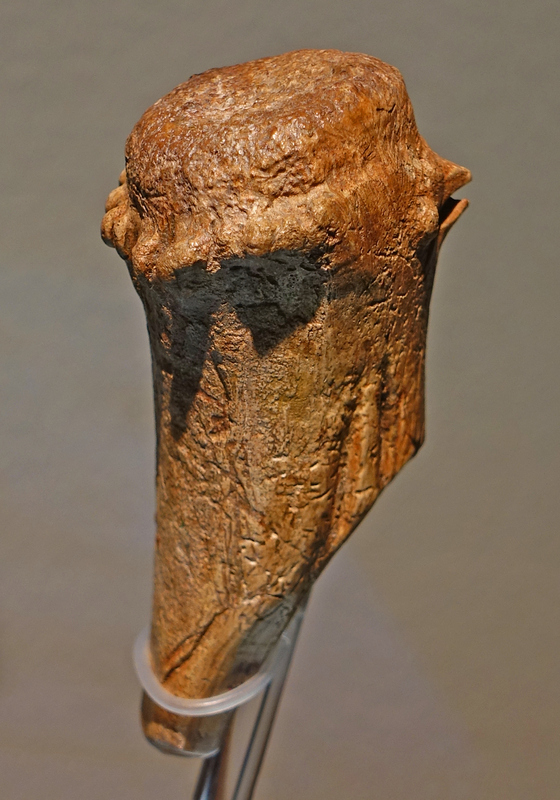 From 1985 he was head of the research division of the Paleolithic Roman-Germanic Central Museum, and from 1988 to 2003 head of the Museum of Archaeology of the Ice Age in Monrepos . 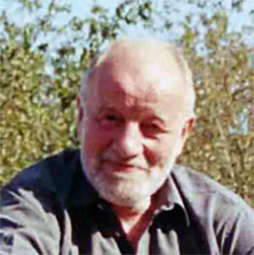 He directed the excavations in Gönnersdorf and participated in excavations in France, Georgia and Russia. He lives in southern France near Montauban . 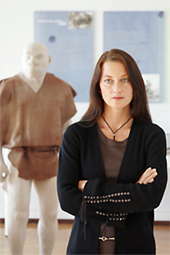 Sabine Gaudzinski-Windheuser is the professor of Palaeolithic Archaeology at the Johannes Gutenberg-University, Mainz, Germany. In addition she is head of the Department of Palaeolithic Studies at the Römisch-Germanisches Zentralmuseum. Her major research interest is the evolution of hominin behaviour and she has conducted research and excavations in all phases of the Palaeolithic. 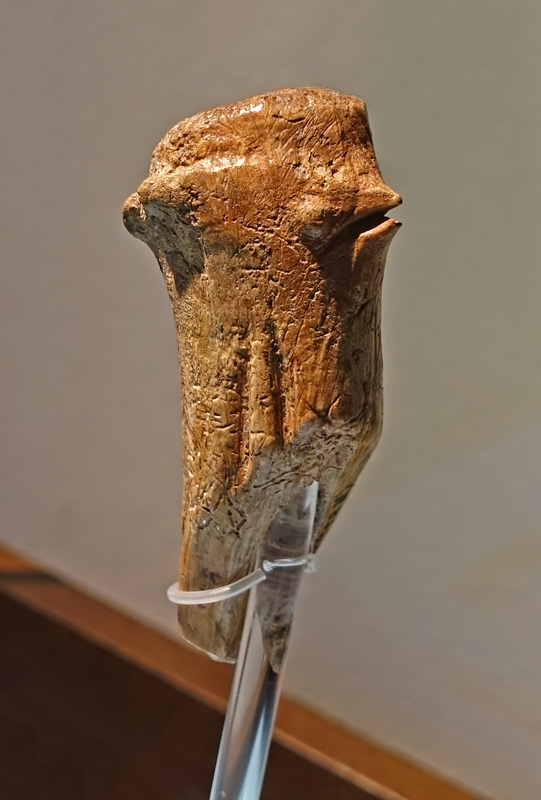 She is a 'specialized generalist' in Palaeolithic Archaeology with particular expertise in Archaeozoology, Taphonomy and Neanderthal subsistence strategies. 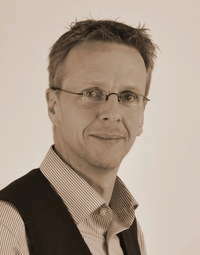 Olaf Jöris is a senior scientist at the Department of Palaeolithic Studies (Forschungsbereich Altsteinzeit) at the Römisch-Germanisches Zentralmuseum Mainz, Germany, and lecturer in Prehistory at the Institut für Vor- und Frühgeschichte of the Johannes Gutenberg-Universität, Mainz, Germany. He has been involved in numerous international research projects and has conducted field work at sites from different Palaeolithic periods, including, for example, excavations at the Lower Palaeolithic site of Dmanisi in Georgia. He is a specialist in the analysis of lithic remains, analysis on intra-site spatial organisation of Palaeolithic sites, radiocarbon dating and calibration and population dynamics of Palaeolithic societies in changing environments. 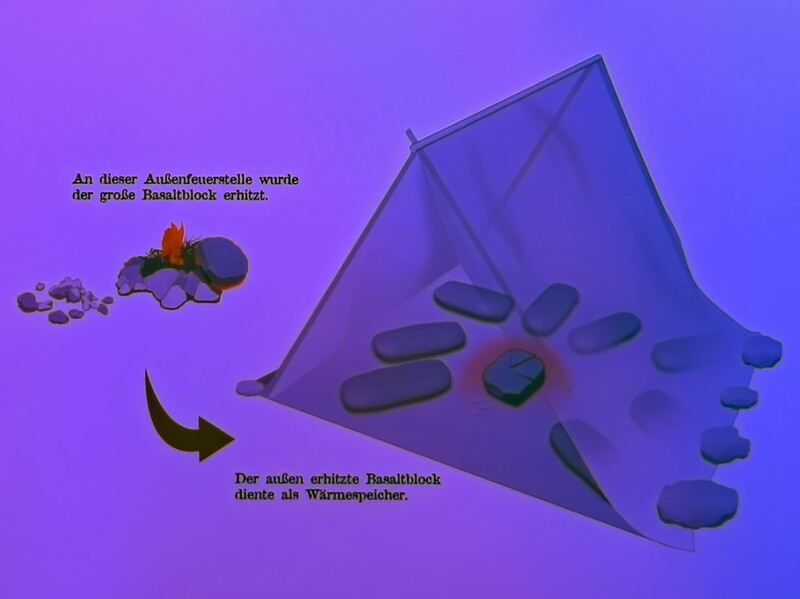 Bosinski, G., 1979: Die Ausgrabungen in Gönnersdorf 1968-1976 und die Siedlungsbefunde der Grabung 1968. Der Magdalénian-Fundplatz Gönnersdorf Band 3. Wiesbaden. Bosinski, G., 1981: Gönnersdorf. Eiszeitjäger am Mittel rhein. Schriftenreihe der Bezirksregierung Koblenz 2 Koblenz : Rhenania-Verlag, 1981. 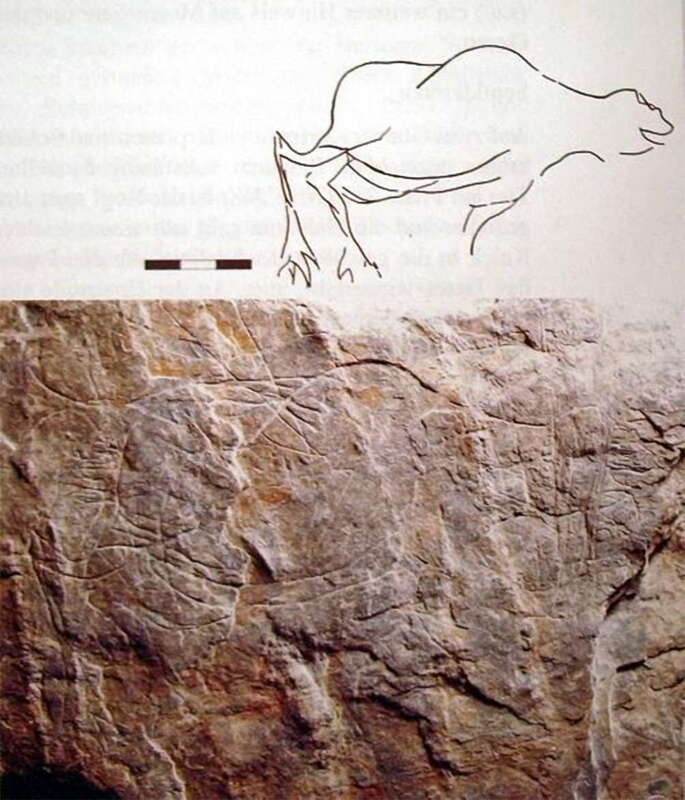 Gaudzinski-Windheuser, S., Jöris, O., 2012: Centextualising the Female Image – Symbols for Common Ideas and Communal Identity in Upper Palaeolithic Societies in: F. Wenban-Smith / F. Coward / R. Hosfield / M. Pope (Eds. ), Settlement, Society, and Cognition in Human Evolution. Matt Pope. Cambridge University Press. 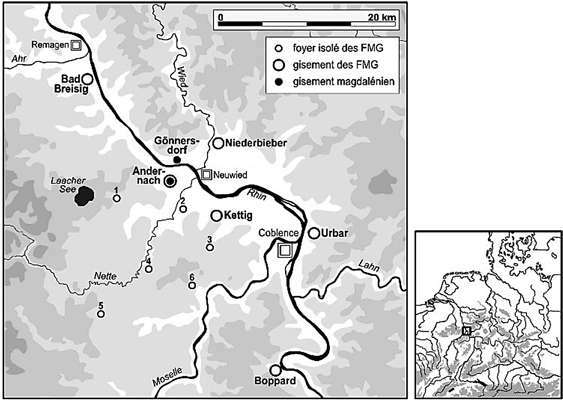 Jöris, O., Street M., Turner E., 2011: Spatial Analysis at the Magdalenian Site of Gönnersdorf (Central Rhineland, Germany) – an Introduction RGZM-Tagungen. Jöris, O., Gaudzinski-Windheuser, S., 2006: 600 000 years of human history in the middle of Europe Book accompanying the exhibition at the Museum of Archaeology of the Pleistocene, Monrepos (Mainz). 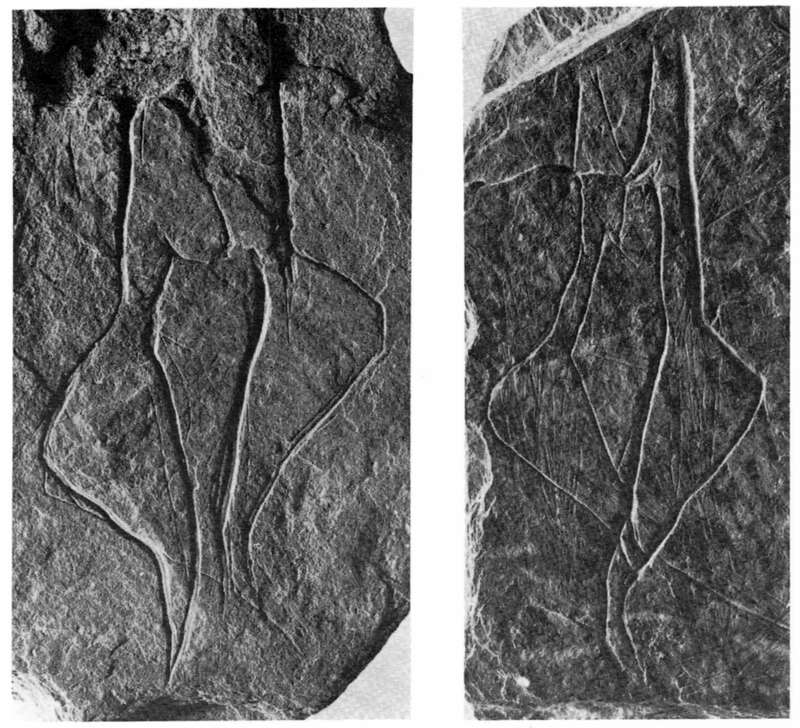 Mikhailova, N., 2006: The Cult of the Deer and Shamans in Deer Hunting Society, Archaeologia Baltica (Vilnius), 7 (2006), 187-198 : Abb. 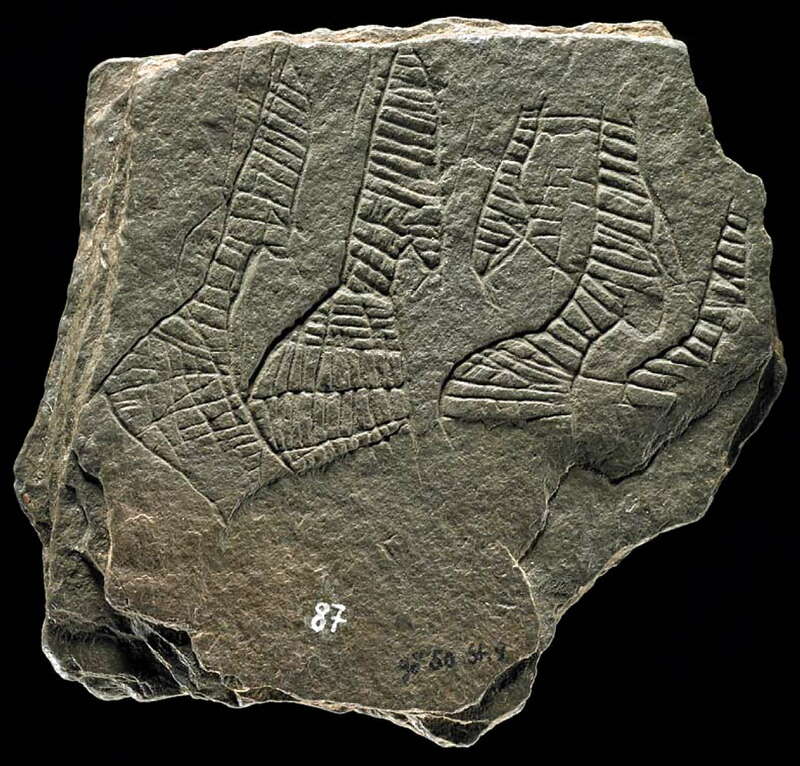 Moseler, F., 2008: Die Konzentration IV von Gönnersdorf. Eineräumliche Analyse der Steinartefakte. 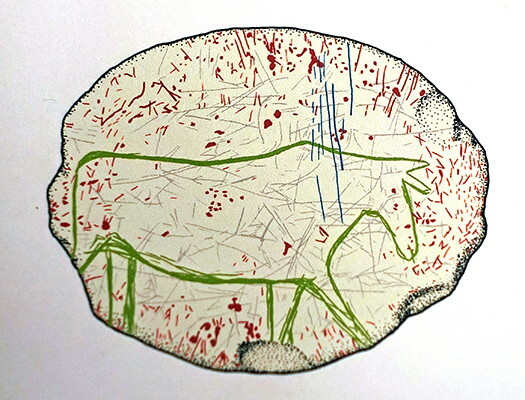 In: Sensburg/Moseler 2008, 55-168. 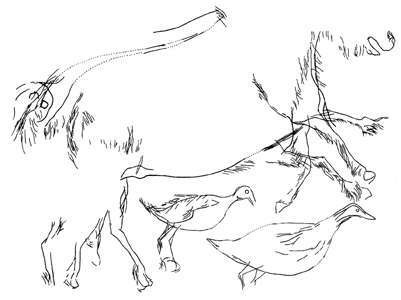 Roveland, B., 1990: Ritual as action: The production and use of art at the Magdalenian site, Goennersdorf, Unpublished M.A. thesis, University of Massachusetts. 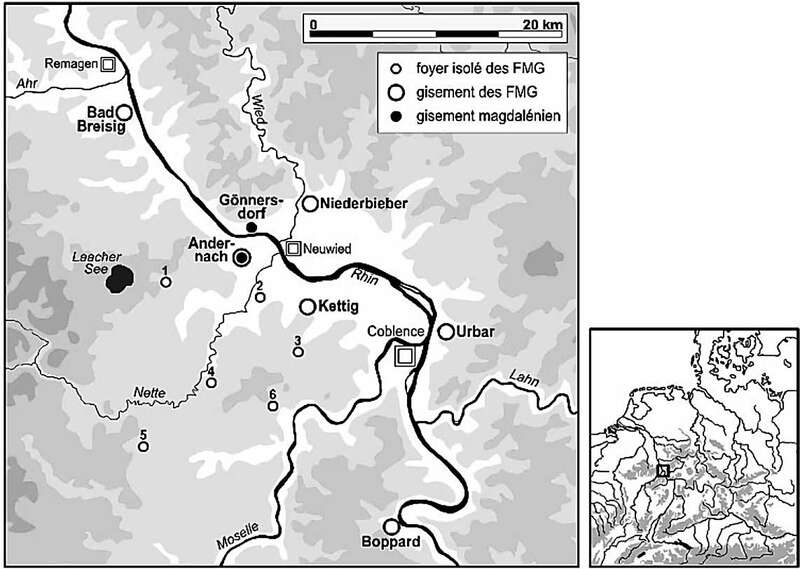 Sano, K., 2012: Functional variability in the Magdalenian of north-western Europe: A lithic microwear analysis of the Gönnersdorf K-II assemblageQuaternary International , 272-273: 264-274. Sensburg, M., Moseler F., 2008: Die Konzen-trationen IIb und IV des Magdalénien-Fundplatzes Gönners-dorf (Mittelrhein) Monogr. RGZM 73 ( Mainz 2008).